A monstrous covenant between the PKK and the organization of the apostate Arameans who identify themselves as “Assyrians”, namely: The Assyrian Democratic Organisation. Goal of this covenant: To falsify the Aramean history, Mr. Abdullah Ocalan says "The history will be rewritten"
Following Hezballah, now also PKK tries to recruit Christians (and falsify their history). 1. The beginning of this monstrous covenant: How did this took shape? 2. What sort of agreements were made between the apostate Arameans, that is to say the Western spiritual colonization and slavery product “Assyrians” and the PKK? 2.1 Establishment of a sister-organization of PKK and recruitment of youth in the West. 2.2. The demands of ADO: Conduction of history distortion of Aramean nation. 2.3. If PKK prevails, the “Assyrians” would share in this victory. 3.4. Abdullah Ocalan meets with bishop Yohanna Ibrahim of Aleppo. 3.5. The province of Cezire (= Tigris) in northern Syria. 3.6. 1998: Turkey want to shut down St. Gabriel monastery. The bitter fruits of the Western intervention with the Middle-east has led to horrible results. Misusing the name of Jesus Christ of the Bible, in the 16th and 19th centuries they came to the Middle-east and acted as “protectors” of Aramean Christians resulting in: hatred, division, fanaticism, nationalism, inciting father against son, daughter against mother through which the Aramean nation was doomed to extermination. They have created unprecedented hatred and jalousie within Muslims towards our people. They have used Turkish Sultanate and other powers in the region against the Aramean nation and killed them hoping that the Arameans would cry for help to the Catholic or Protestant missions in order to covert them to the horrible ideology of Jesus of the West, who of course has nothing to do with Christ Jesus of the Bible. They have forced, killed or bribed them to accept the abominable ideology of Jesus of the West. When the Catholic missionaries together with France in the 16th century succeed to brainwash a part of the East- Aramean nation and gave them the name “Chaldeans” and named their church “Chaldean church of Babylon”, Great Britain could not permit to lag behind. Therefore, the English diplomats and Anglican missionaries started, as a countermove, to play the same game in the 19th century, now with the remaining part of the East- Aramean Nestorian tribes of Urmia (Iran) and Hakkaria (Turkey) who were brainwashed to call themselves “Assyrians” which later manifested itself in a horrible and perverse form of fanaticism which resulted amongst others in history distortion. Everywhere in the Aramean ecclesiastical and secular books they exchanged the words “Aramean”, “Aramaic”, “Syrians” for “Assyrian”. Aramaic language they changed in “Assyrian” language, Aramean people in “Assyrian” people, etc.. etc.. Thus a kind of spiritual genocide took here place. The Arameans who call themselves “Assyrians” have seized every opportunity to promote “Assyrianism”. Whether we are dealing with the genocide issue, or human rights situation of our nation in the Middel-East or social problems with the youngsters in the West, their ultimate goal is definitely not the problem or the subject in question, but only and exclusively the promotion of the unholy name “Assyrians”. This fanatical inner urge to history distortion and glorification of “Assyrinaism” has reached an abominable climax in a covenant which they made with the PKK. This monstrous covenant was discussed in detail in four-pages in the Kurdish PKK newspapers “Berxwedan” of 15 June 1993 which was published in Turkish. Below we present you the complete translation of Berxwedan with the left Column the original Turkish text and right column the translation in English. We also have made available a high resolution A3- scan of original newspaper which can be downloaded or be read online. However, first we will drop few introductory remarks as background information for the reader to get a comprehensive picture of the matter we wish to explain. 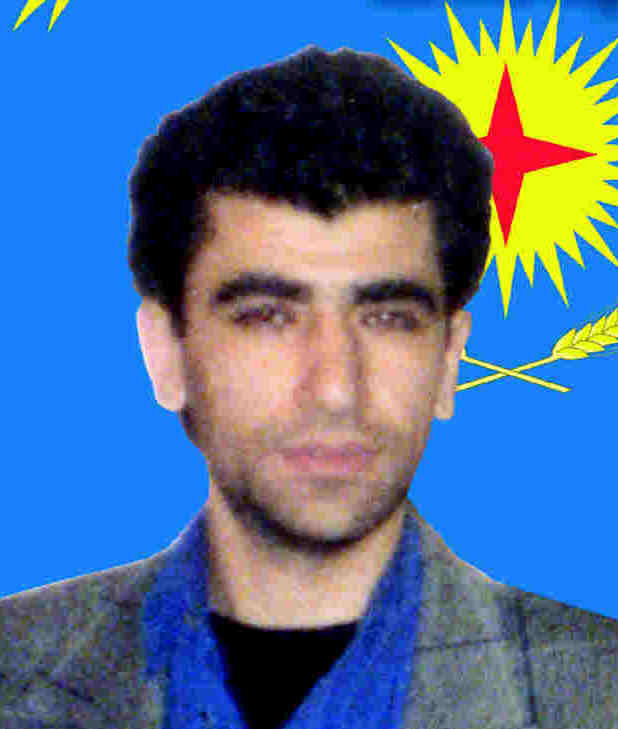 Numan Ugur (Numan Shabo, Numan Ogur, Numan Nesro/Nisro), the second man of PKK after Abdullah Ocalan. 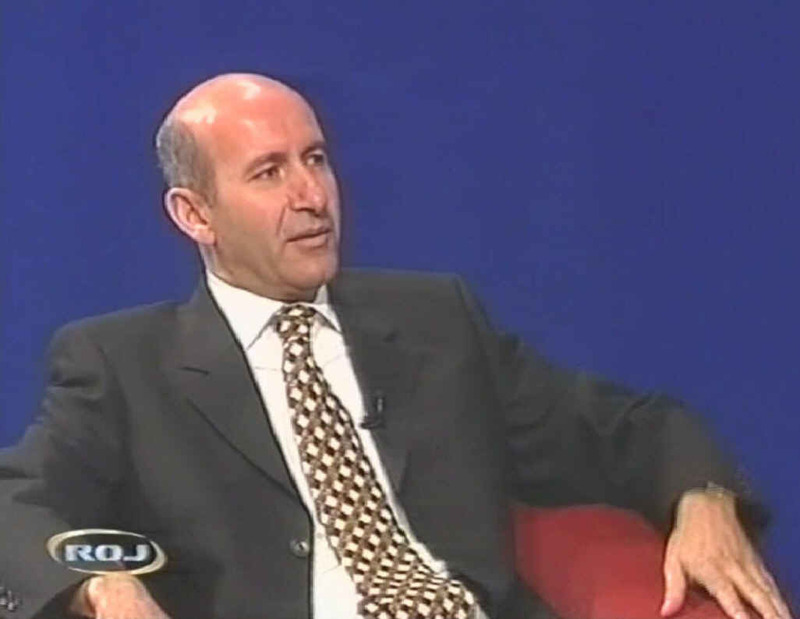 Mr. Ugur joined PKK around 1985. 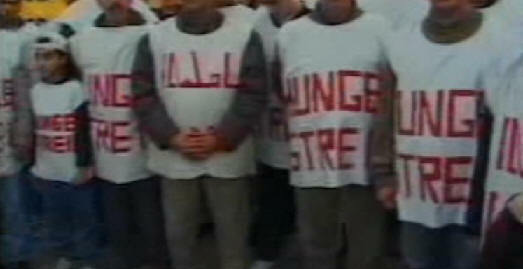 The date '85 on his shirt probably is representing his joining the PKK and initials 'N.U' for Numan Ugur. It is well-known for years that Hezballah recruits Christians to open doors which normally would remain closed. The PKK seems to have learned something from it. At the climax of their struggle, around 1984, the PKK managed to recruit few “Christians” in southeastern Turkey. One of this Christians was a certain gentlemen named Numan Uğur from the village of Mezizah, Tur Abdin (southeastern Turkey). Numan Ugur became a confidant of Abdullah Ocalan, a close co-worker, the second man of PKK. When Ocalan was absent, Ugur got responsibility. For more details about Numan Ugur/Shabo/Ogur/Nesro/Nisro and his involvement with the PKK we refer to our analysis of 20 of April 2018 entitled: "The Western Anti-Aramean colonial product “Assyrians” and unconditional loyalty to PKK/YPG and Abdullah Ocalan"
1.1 Numan Ugur, the friend of Abdullah Ocalan, comes to Germany in 1993. This quote is an evidence of good relation between Ugur and Ocalan, for the newspaper Berxwedan belongs to PKK and every word is carefully being weight. Therefore statements like this were written with a certain purpose. Furthermore, please take note of the fact that Mr. Ugur is very important for the PKK, for they only write his initials, namely: N.U. 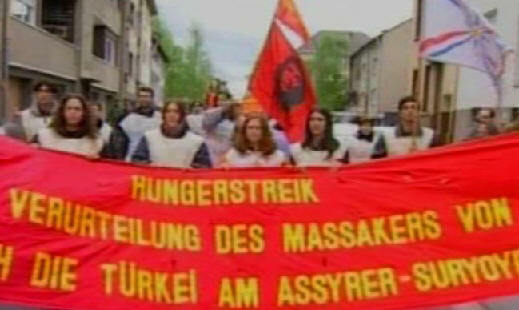 Thus in 1993 a delegation was composed in the “Assyrian” association Bethnahrin in Augsburg (Germany), under leadership of the second man of PKK, Mr. Numan Ugur, and they visited Abdullah Ocalan in Syria to seal the monstrous covenant. · Establishment of a sister-organization of PKK and recruitment of youth in the West. · Falsification of Aramean identity. · If the PKK would prevail, the “Assyrians” would share in this victory. Here below, we are going to discuss each point in detail. ADO and PKK agreed to establish a sister- organization of PKK by ADO and it would be supported by PKK, morally as well a financially. 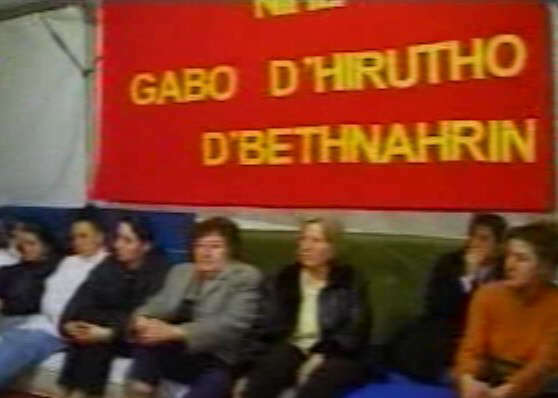 This sister-party of PKK became known after its establishment as GHB (In Aramaic: "Gabo D'Hirutho D'' Bethnahrin"= Mesopotamia Freedom Party). Later it changed its name in MUB (Mautobnutho Umtonoyo Bethanrin= Mesopotamia National Organization). 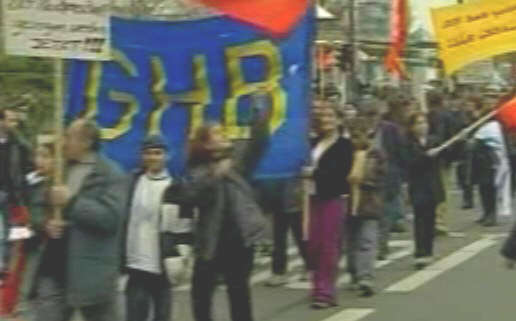 During many demonstrations the "Assyrian" GHB/PKK/ADO terrorists glorified their terrorist organization GHB. To implement this covenant, the “Assyrians” and PKK established a sister party of PKK supported by PKK, morally as well a financially. This sister-party of PKK became known after its establishment as GHB (In Aramaic: "Gabo D'Hirutho D'' Bethnahrin"= Mesopotamia Freedom Party). Later it changed its name in MUB (Mautobnutho Umtonoyo Betnahrin= Mesopotamia National Organization). For years I struggled alone, but at this moment the PKK achieved such a level that it is undefeatable. We want you also to contribute to this/ to become a part of it. This would give evidence of your reliability. We are ready for that and are eager to see that (from your side). We also want to help when you return back to your villages. We are ready to do everything possible we can. Yes, I don’t know exactly, what is your real requirement, what is the status/ structure of the organization (to be established), this issues I wish to here from you. It is clear that the Syrian contribution (to the PKK), to the new building up ( of the region) in the liberation of the people may play a pronounced role. We are building up a front. I believe that the Assyrian movement also should get a place within this front. The Syrians living in Syria originate for a important from Turkey. As result of this, those (Syrians) liven in Turkish Kurdistan can participate in the front. That is why they directly can participate (in the front). If they are available, we can also send some youngsters to the mountains (for the struggle). I believe that we have done all the necessary for a important from our side. Do you want also to try this? The caravan of revolution is moving forward, are you prepared to participate to this caravan? I believe you should for sure take a place in this (revolution). As I told (before), we may also call you for the front. This also shall make your people more trustworthy, make the Assyrian identity legitimate, preparing the people. The aforementioned statements speak for themselves. They all literal became true. On the availability of the Kurdish media for the “Assyrian” propaganda the PKK leader says,, You should write, our magazine, newspapers are open (for you). (Page 19, Column 4). It will be written anyway in agreement with your wishes. In addition they got 12 hour free of charge broadcasting time on the PKK channel MED-TV for their propaganda. During this demonstration the "Assyrian" terrorists carry the photo of Che Guevara, the man of communist freedom, who have been glorified by the PKK. Everywhere the sister party of PKK, the GHB was glorified and the youngster were stimulated to join the struggle with the PKK in north of Iraq. How would the establishment of GHB, the sister party of PKK take shape? We as, Assyrian Democratic Organization, bother also about those who fled to foreign countries. In Europe and other countries we have associations, federations with the aim to realize the unity within our people and carry out similar activities. A major part of our people is connected with the associations and federations. 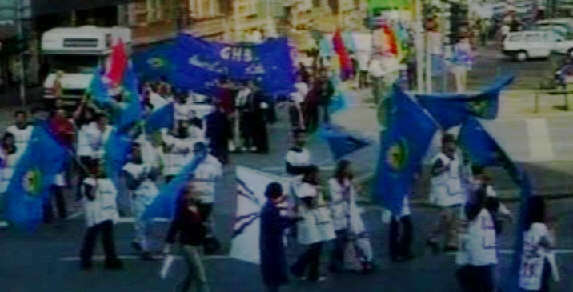 Yes indeed, dear reader, the establishment of GHB took place thanks to the presence of associations and federations of the apostate Arameans who call themselves “Assyrians” – the ultimate product of hatred, division and the Western spiritual colonial inner urge of extermination- in Germany, Sweden, Holland and other countries. In Holland for example, as it is known to everybody, the “Assyrian” Mesopotamian Association in Enschede have ties with ADO (in fact the majority of “Assyrian” organizations) and the people involved within this association, of whom some originate from Syria are, as we know, the old ADO members. And what is here going on? Since many years, the municipality of Enschede is subsidizing this association without hesitation. 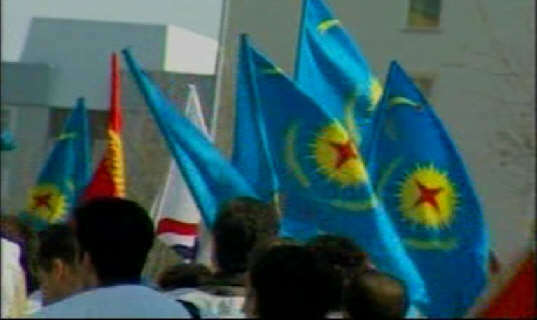 The flag of GHB: The flag of GHB is derived from the flag of PKK. The "Assyrian" GHB/PKK/ADO terrorists have done everything possible to carry out their covenant with the PKK, including using children during their so-called "hunger strikes" to recruit youngsters for the struggle in the north of Iraq. Thus: The organizations of apostate Arameans who call themselves “Assyrians” and nourish deep contempt towards the Aramean nation, were mentally being prepared and mass meetings were being organized to recruit youth for the combat. But of course, these activities were carried out under the cover of “genocide”, “cultural manifestation”, “human rights”, etc.. etc.. The main goal was however to recruit people for the struggle of PKK in agreement with the proposal of Mr. Abdullah Ocalan, quoted previously. The terrorist “Assyrians” were so successful, thanks to the support of PKK, that they already had recruited 200 people in the 2001 who were active in the camps of PKK. In Holland, for example, they organized hunger strikes in front of police station in Enschede and other activities to involve the youth with the PKK. Amongst other an Aramean policeman from Amsterdam, Mr. C. Kulan, was recruited and killed in northern Iraq, because he refused to participate in the struggle against the Turks. Kulan left behind his wife and two children. Please be informed that he was not killed by Muslims, but by his own terrorist “Assyrian Christian” brothers. The terrorist “Assyrians” however call Kulan a “martyr” and “forget” to mention that they themselves have killed him. On SuroyoTv they regularly call him “martyr” without mentioning that his friends killed him. In return for the aforementioned, ADO asked for glorification of the name “Assyrians” in the Kurdish media. A kind of “Assyrianisation” of the Aramean nation was started in all the PKK dominated media, and there are many, to falsify the history of the Aramean nation. They had joint meetings with the politicians of various European countries and European Parliament and talked always about “Assyrians” to fulfill the agreement made within the horrendous covenant. Chairman APO: I say forty times that the Assyrians do exist. It will be written anyway in agreement with your wishes. Dear reader, please take a deep breath and read the aforementioned quotes again. Really, one gets shocked. The product “Assyrians” of the Western spiritual colonial activities in the Middle-East which resulted in the complete decline of the Aramean indigenous nation of the Middele-East are so thoroughly evil and de-humanized and perverted in their minds that they even have no problem to sacrifice boys and girls in order to make known the lie-name “Assyrians”. As a matter of fact the PKK of Mr. Ocalan committed a spiritual genocide against the Aramean nation by the glorification of the criminal and perverse spiritual product “Assyrians” to distort the history of the Aramean nation. Their forefathers have together with the Turks cut our people in pieces and what they are now doing is finishing the work of the Western spiritual colonial activities which factually exterminated our nation. To ensure a free access to the Kurdish Media to glorify and implement the criminal “Assyrians” ideology and with that to falsify the history of the Aramean nation. To maintain the contacts between the PKK and “Assyrians”. Factually, Mr. Ugur was the representative of PKK to Assyrians and representative of Assyrians to PKK. The Aramean nation was not only “assyrianized” and terrorized by the Kurdish newspapers and magazines, but this also extensively was done by the PKK broadcasting channel. The apostate Arameans who call themselves “Assyrians” got 12 hour transmission time free of charge with the PKK channel MedTV. In 1994 Med TV was granted permission for 10 years in United Kingdom. This permission was revoked on 23rd of April 1999 because of the ties MedTV had with the PKK. After this, the name was changed in MedyaTV. MedyaTV was granted permission in France on 30th of July 1999 and programs were transmitted from Belgium. On 13th of February 2004 the permission was revoked in France for the same reason of having ties with PKK. After this they changed their name in RojTV. RojTV was granted permission in Denmark on 1st of march 2004. Whether the name is MedTV, MedyaTV or RojTV, the apostate Arameans who call themselves “Assyrians” and are eager to distort the history of the Aramean nation, had a free access to this PKK broadcasting channel. One of the people who on behalf of ADO/GHB is organizing terror against the Aramean nation to distort their history is madam Atiyya Tunc. The “twelve hour” free of charge transmission time they got from the PKK, was of course due to the agreements they made to distort the history of the Aramean nation. “Free of charge”?, well not exactly, because people were sacrificed in the north of Iraq in the struggle of PKK against the Turks. Madam Tunc was also extensively active with organizing of divers “activities”, such as “hunger strikes” and other activities under direction of ADO/GHB. It is madam Tunc who succeeds to make the politicians of European Parliament her doormat in order to falsify the history of the indigenous Arameans and represent this by the criminal name “Assyrians”. One may ask the question: Are these politicians so naïf and blind or are we dealing here with purposeful evil act to terrorize and taunt the Aramean nation? In December 2001, madam Tunc started under direction of JARABEE youth welfare work in the area of Twente in Holland a gigantic hullabaloo and was screaming from the housetops about the problems around “Assyrian- Suryoye” youth, as she mentioned. But of course the first concern of madam Tunc was not the “virtual problems” she had created around the youth, obviously not! On the contrary, what she had in mind to achieve with this hullabaloo was, as usual of course, the glorification of the criminal, immoral and perverse Western spiritual colonial and slavery product “Assyrians”. That was her main goal, exactly as laid down by ADO. The problem is however, how can you motivate the press and politicians with this self created “problem” of madam Tunc? To achieve that, she came with the story that it was important to take a journey to Syria to understand how the people there were living. And this could contribute to better “assistance” to the "problem-youth" in Holland. With this hullabaloo story she succeeded to mobilize some journalists and some members of municipality council of the city Enschede to undertake a journey to Syria. One of the journalists was Madam Judith Neurink of the Dutch national Newspaper “Trouw”, whom we consider as evil, de-humanized racist and malicious person. 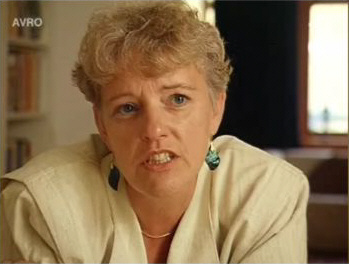 Judith Neurink, Journalist of Newspaper Trouw, became doormat of madam Tunc. 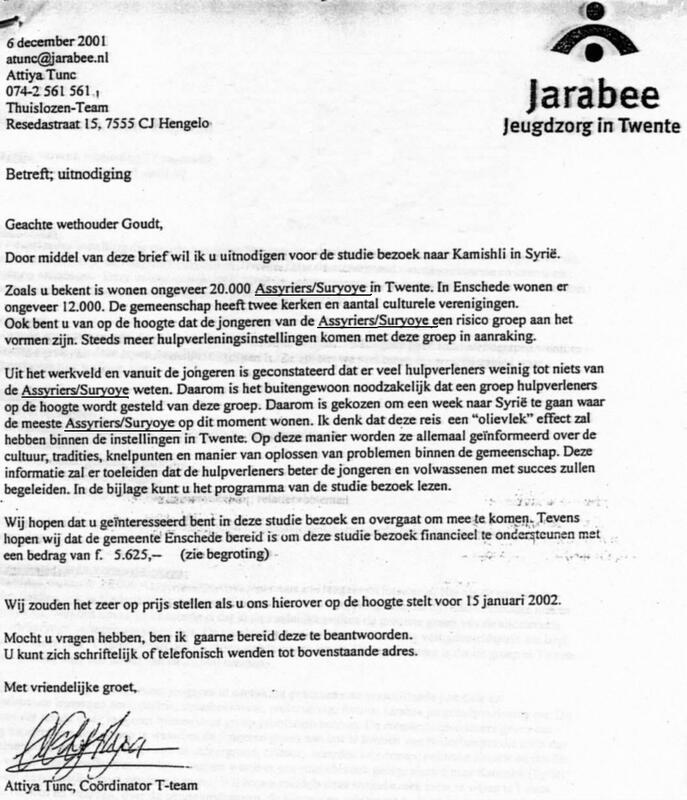 Upon her return from Syria, a article was published on 12-4-2002 in the newspaper “Trouw” from the hand of madam Neurink entitled “Syrië verscheept minderheden naar het Westen (=Syria is transshipping minorities to the West”. Obviously madam Tunc has acted as translator. However, who is this leader Nesro, madam Neurink is talking about? 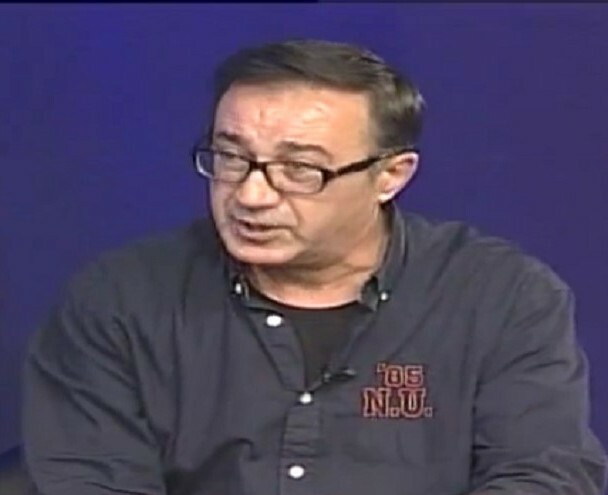 This Nesro is nobody, but Mr. Numan Ugur, the "Christian" recruit from Tur Abdin and second man of PKK, and his organization Beth Nahrin, the Freedom party is GHB, the sister organsiation of PKK, supported and financed by PKK. One of the aliases of Mr. Numan Ugur was indeed Numan Nesro. But of course, the meeting between madam Neurink and Numan Ugur (alias: Nesro) was carefully orchestrated by madam Tunc, for that was her main goal of all the hullabaloo and fanfare which she cried from the housetops as “social worker” to “help” the youth. And exactly the same fanfare and crocodile tears she is now shedding about the situation in Iraq. Needless to say, however, madam Tunc in advance had instructed the people in Syria the words and phrases they had to say when they were talking with madam Neurink. As a matter of course, madam Tunc “guided” madam Neurink to villages, cities and districts which madam Tunc in advance had advised what to say when Neurink would ask them questions. Recently she did exactly them same with Joel Voordewind in north of Iraq and before him she did the same with Camiel Eurling and Albert Jan Maat. Her doormat of history falsification seems to be very attractive to these people. Thanks to the means provided by PKK, the cooperation of some politicians within European Parliament, and people like madam Tunc, the Aramean history indeed seems to be rewritten, that is to say: falsified and represented under the criminal Western immoral lie-name “Assyrians”. And with that, the words of Mr. Abdullah Ocalan seem literal to be fulfilled. The last agreement made between the PKK and “Assyrians” was that if Kurdistan would be liberated by the PKK, the “Assyrians” would also share in this liberation. Abdullah Ocalan says on page 20, column 5 “Our victory will also be your victory”. This sentence is printed as Headline on page 16 and 17 of Berxwedan. Another person who plays an important role in the realization of the agreement made between ADO and PKK is Mr. Circis Aslan. Circis Aslan is family of madam Tunc, he is married with her sister. Circis Aslan was one of the founders of PKK Parliament, as he explains in detail in a article published in the Dutch Newspaper The Volkskrant of 6-5-1995. When he came to Holland he changed his forename in Ferman Aslan. It is not clear why he changed his name into Ferman. However, we do know that he had an Islamic companion in Istanbul called “Medenio”. Aslan and Medenio seems to have been involved with matters which did not pleasure Turkish authorities. For this reason, as we were told, Aslan and Medenio were living at odds with Turkish attorney general (there are many story about this). Perhaps that could be the reason of the change of his forename from Circis to Ferman. The name Aslan (= Lion) is a common name in Turkey. Therefore, one should not bother about that. By changing the forename from Circis to Ferman, a good camouflage is being created. In public however, he is presenting himself always by his alias, namely “George Aryo”, as for example he did in various programs of PKK ROJ TV, in an article of Volkskrant and in an interview of Zenda Magazine. Circis is the Turkish name for George, and Aryo is the Aramaic name for Lion (in Turkish, this is Aslan). Indeed, in his alias, his original name is hidden, namely: George Aryo= George Lion= Circis Aslan. In Zenda Magazine of 7-12-1998, Mr. Aslan gave an interview, of course under his alias “George Aryo”. And who conducted the interview on behalf of Zinda? We read "an interview conducted by ZENDA's correspondent in Amsterdam, Mr. Matay A. A. Arsan, with Mr. George Aryo of the Assyrian Federation of Holland"
And who is this “Matay A. A. Arsan”? Well, this is nobody but Metin Tunc, the brother of Attiya Tunc and the brother of the wife of Ferman Aslan who was studying at that time in Amsterdam. He had made himself known by various names such as "Ashuroyo", "Matay Beth Arsan" etc.. In this interview Mr. Aslan says about PKK “" From the beginning PKK has thought of our people as an oppressed people and the oldest inhabitants of Beth-Nahrin. PKK believes that our people must receive as much attention as that of the Kurdish people. The PKK has never been hurt by our people and therefore it considers us more as a friend then as an enemy"
Comparison between statements made by Abdullah Ocalan and Ferman Aslan. From the beginning PKK has thought of our people as an oppressed people….. I keep myself intensively busy with the Assyrian history; again I intensively keep myself busy with their culture, civilization…. PKK believes that our people must receive as much attention as that of the Kurdish people. ... . The PKK has never been hurt by our people and therefore it considers us more as a friend then as an enemy"
...that which the Kurds call Kurdistan, we Assyrians call Assyria (Volkskrant 6-5-1995). Why dear reader, why does Mr. Aslan try to promote PKK? What kind of interests does he has to do so? Why does he try to make the PKK ‘sweat’ and acceptable? What is behind that? Perhaps we can get more insight in the matter by looking more in detail at the newspaper Berwedan and study carefully some statements of ADO and Abdullah Ocalan. 1. They have learned “nice truths” about the PKK which they before were not aware of. 2. They are impressed by Mr. Ocalan and PKK and because of that they are “delighted”. From this, we may understand that most probably the reason Mr. Aslan is promoting the PKK can be traced to the promises of ADO to make the organisation acceptable within our nation. However, there is more going on, if we look at the statements of Abdullah Ocalan. He promises that more meetings would take place between ADO and PKK, and we may assume that this indeed did happen. In other words, taking into consideration the details Mr. Aslan is revealing us about PKK, we get the impression as if he himself was one of the people, on behalf of ADO, who visited Abdullah Ocalan. For this reason we believe, bearing in mind his involvement withing PKK if we look at his interview in Zinda Magazine and the details he reveals to us, that Mr. Aslan also may have attracted the attention of the family of wife for the PKK, namely Attiya Tunc (alias: Attiya Gamri, Attiya Gamri Beth Arsan, Attiya Arsan) and her brothers. The Aramean nation is being taunted and tortured by them, for they demonstrate an extraordinary inner urge to falsify our history. Ferman Aslan says in Zinda Magazine of 7-12-1998: "Many countries did not even know that Assyrians still exist! We have visited Russia, Europe, the Middle East, the Caucasian countries, and South Africa. And wherever this parliament was the Assyrian question was discussed also! This is a great accomplishment for our people. When there is no voice for our people, especially from the homeland, then this work will not be permanent. From every corner and region our voices must heard- loudly." And indeed, dear reader, this was one of the goals of the monstrous covenant between ADO and PKK, namely to distort the Aramean history and representing it by the “Assyrian” falsehood. And Mr. Aslan seems to be proud of it. 1. Where do the Kurds get their money to run such huge broadcasting channel? Yearly, it cost millions. Not of interest to madam and Mr. to know where the money comes from? The goals justify the means? 2. What possibly have possessed the Kurds to provide madam Tunc and Mr. Aslan with free of charge transmission time of 12 hour per month? Is that because of their generosity and charity? Threat by Madam Tunc and Ferman Aslan…. 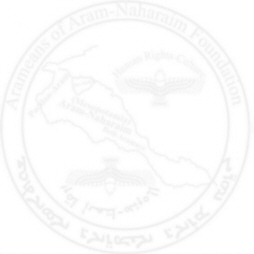 The Arameans of Aram-Naharaim organization is the only organization which sticks its neck out for the interests of the Aramean nation. It is the only organization with the courage to make stand against misdeeds committed against our nation. The monstrous covenant between ADO and PKK to falsify the history of the Aramean nation is perverse, criminal and heinous deed not only against our nation, but against humanity and therefore we should say something about it. And those who shut up their mouth and remain silent, are even worse criminals and terrorists, because silence lends consent! The executers of this horrible covenant are of course not happy with our activities. Both Mr. Ferman Aslan and Madan Tunc have threatened Aram-Naharaim. 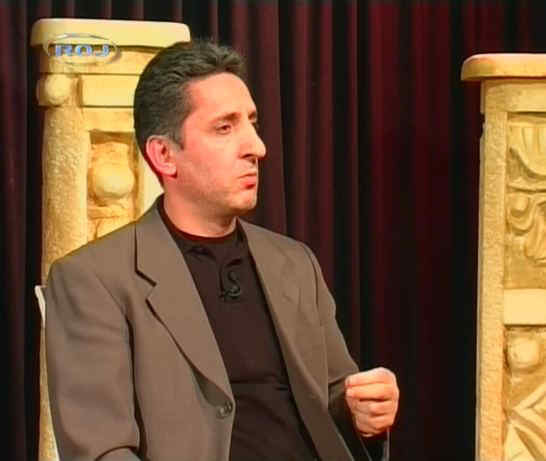 Mr. Ferman Aslan talked to an employ of the St. Afrem monastery in Holland, because this employ knows the chairman of Aram-Naharain, and threatened the chairman of Aram-Naharaim with the words “If tomorrow something happens, you should not complain”. Madam Tunc is member of the Provincial States on behalf of the socialist party in Holland (PVDA). We don’t know whether madam Tunc made this threat indeed with the permission of the chairman of her party PVDA or that she did this on personal initiative and involved the name of the chairman of her party to give more authority to her threat to the chairman of Aram-Naharaim. If indeed it is true what she claims, the behavior of PVDA can be described in two words, namely: Criminal and perverse. Everyone who is so cowardice to fear the threats of madam Tunc and Ferman Aslan is a murderer, sexual sinner, sorcerer, idolater a lair and a dog etc.. etc.. A Christian who gave his life to Christ Jesus shall never fear the threats of Aslan and Tunc, only a dog, a sexual sinner, a sorcerer, a murderer and a liar will fear their threat. There are indeed many of this cowardice people within our nation. Why, you could ask the question? Well if such cowardice people would not exist within our nation, people like madam Attiya Tunc and Ferman Aslan would not so easily gain accesses to our monasteries and churches. Only a cursed and a criminal people, who is ripe for a heavy judgment of the Lord God, gives Mr. Aslan, Madam Tunc and all others with them permission to enter these holy places. A normal Christian community, obeying Christ Jesus, would immediately drive them away, like for example the courageous warriors, the Lions of the St. Charbel Church in Amsterdam. 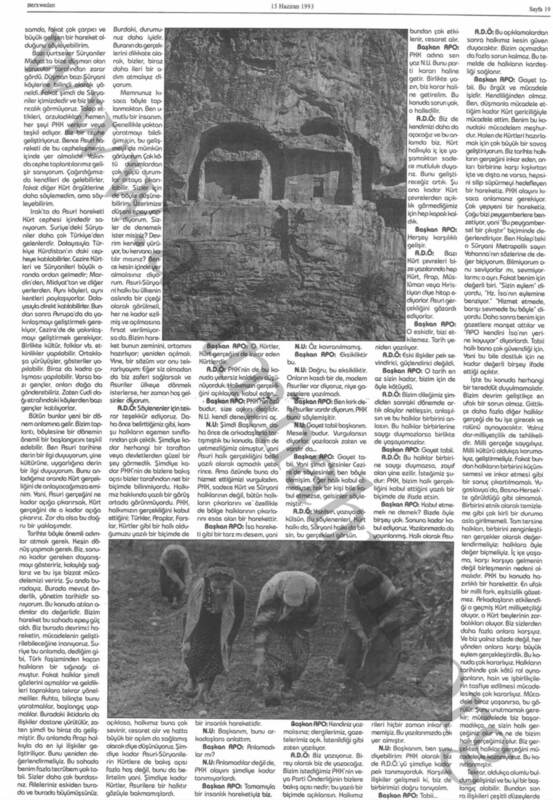 What does Mr. Abdullah Ocalan mean by the words “some youngsters from the villages around the Cudi- mountain “? The mountain of Cudi is in Southeastern of Turkey, the area of Hassana where the East-Aramean Nestorian Protestants come from. These Protestants were also called “Msiha.. Msiha.. Allaha... Allaha (Jesus, Jesus, God, God) Protestants. As Mr. Ocalan indicates, the young people from the villages around Cudi Mountains already in 1993 were participating in the activities of PKK. When the Turkish secret service discovered this, they blew up the villages and the inhabitants fled to the West. A part of them came to Holland and settled in the area of Wierden and another part settled themselves in Belgium, in the area of Antwerpen/ Mechelen. In 2000, the current affairs program “RADAR” of the Evangelical Broadcasting (EB) Channel made coverage on the villages of Hassana. A certain reverend named Mete from Wierden (Holland) went with them to southeastern of Turkey to visit his bomb flatted villages. He was not allowed to enter the villages. In the coverage of EB under leadership of Mr. A. Lock, the Turkish government was heavily criticized. However, there was not mention of a single word about the young people from the villages of reverend Mete who joined the activities of PKK. Reverend Mete who presented himself as the man of God “forgot” to mention that, he and others with him, were accessory to the destruction of the villages by the Turkish army. He and his fellow believers should have prevented their youth not to join the activities of PKK. The Turks would than have had no excuses to blow up these villages. Not only that, yet it is a antichristian act where people like Mete (and his fellow believers) apparently do not give attention to understand that you as a Christian should keep yourself clean of these unsavory issues. However, they immediately are ready to complain and yowl and spit others in their face, but seem to have no time to look in the mirror and to examine themselves. Oh, but reader, please do not be mistaken, the statement of Mr. Ocalan that the young people from villages around the Cudi mountain were participating in the struggle of PKK, is certainly not bluff poker, on the contrary. Such a statement by Ocalan should certainly be considered as very serious. 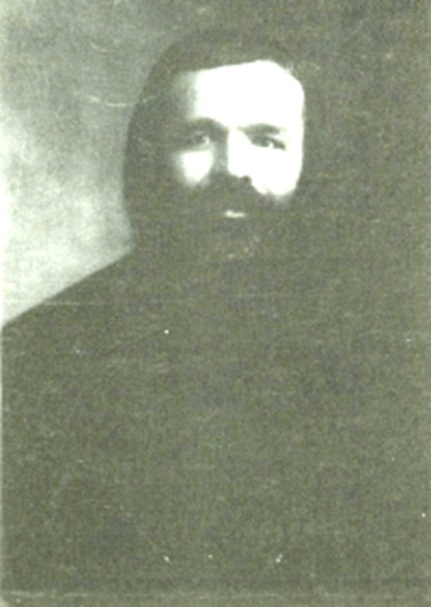 The Aramean policeman from Amsterdam, Mr. C. Kulan, was the son of the sister of reverend Mete. The “Assyrian” PKK/GHB/ADO terrorists gave him the name “Mihayel Cudi”. If reverend Mete was really a man of God, after the murder of his nephew by his own “Christian Assyrian” terrorist brothers, he would have immediately gone to the press condemning the criminal “ADO/GHB” Assyrian terrorists. However, neither he, nor others have ever publicly said something about this, most probably because they smelled a rat. Since then, the Evangelical Broadcasting channel started a tasteless and ridiculous campaign along with the “Assyrian” PKK/ADO/GHB terrorists to falsify the history of the Aramean nation in Holland, exactly as agreed between Ocalan and criminals of ADO. No, dear reader, please do not be deceived by the empty talks of some racists within the Evangelical Broadcasting Channel when they would say “We didn’t know that”. O, yes, they did know very well, they are a racists, just misusing the freedom of press. This people, who pretend to follow Christ Jesus, love the lie utterly! Why is that so? Well, otherwise they have to condemn unambiguously the criminal acts of their forefathers, who have misused the name of Jesus Christ of the Bible to divide the Aramean nation in the 16th and 19th centuries by the invention of the fake identities “Chaldeans” and “Assyrians”. And that, they will never do! And also that is the reason why they are so eager to deliberately follow the lie in stead to open their mind for the truth. This also explains why this evil bandits love to work together with the PKK/ADO/GHB “Assyrian” terrorists to falsely represent the Aramean nation in Holland. In United States there are plenty of these bandits who misuse the name of Jesus Christ. The story published on various forums by PKK/GHB/ADO “Assyrian” terrorists should be taken with a great grain of salt. Mr. Kulan, the terrorists called him “Mihayel (Cudi) – of course as a reference to the Cudi mountain where also Ocalan was referring to, wanted to go to Iran. Under false pretext they stopped in Iraq. There they told him that he had to fight for the PKK/GHB/ADO, something which he as policeman refused to do so. He then immediately was killed by his own “Assyrian Christian” terrorists and subsequently they put the death body under a snow layer and made some photo’s to fool his family and others that he was died in a snowstorm. This, dear reader, is one of the many evil and satanic fruits of the immoral criminal Western spiritual colonial product “Assyrians”. And they continue with glorifying this evilness as if their forefathers have done a holy and a noble job. To cover-up the killing of Mr. Kulan by the GHB/ADO/PKK “Assyrian” terrorists, in various countries commemoration services were organized. In Holland for example, a service was organized in the city of Enschede in St. Kuryaqos church where the family of Kulan, father, his wife and of course the PKK/GHB/ADO terrorists were present. The mafia is doing exactly the same. After they have killed somebody, they go to the funeral service to extend their condolences. And these criminal terrorists now have nestled themselves within church councils, associations and have unlimited access to the monastery and other buildings, as if they have done nothing wrong. Only a criminal, perverse and cursed people, who have completely put aside Christ Jesus, would allow such terrorists. A normal Christian community would never allow this happen. Out of the question. I value very much the words of the in Aleppo living Syrian metropolitan Mr. Yohanna. I do not know whether he is appreciated or not, that is another issue. However, in my view he is one of the most esteemed. He said “ Your movement”, resembles “ to that of Jesus”. We don’t know what the reason of this meeting was between Abdullah Ocalan and bishop Ibrahim. We don’t know if bishop Ibrahim has anything to do with this monstrous covenant between PKK and ADO. It could be that it was just a normal meeting between the two gentlemen. However, if its is true that bishop Yohanna Ibrahim have said to Ocalan that “Your movement”, resembles “ to that of Jesus ”, this would be very serious and Mr. Ibrahim would not have understand much of the teaching of Christ Jesus. Abdullah Ocalan refers few times to the province of Cezire in the north of Syria. In Cezire the Arameans and Kurd live among each other. The province of Cezire is under the responsibility of bishop Matta Rohom. We don’t know why Ocalan is referring to Cezire. We consider unlikely, however we cannot rule out that bishop Matta Rohom possible also was involved with the monstrous covenant. However, the PKK/ADO/GHB “Assyrian” terrorists had free access to his monastery in Tal Wardit. The last point which we want to discuss in the framework of the monstrous covenant between PKK and ADO was the threat by Turkey in 1998 to shut down the St. Gabriel monastery. In 1998 Turkey threatened the St. Gabriel Monastery to be shut down because, as they said, of recruitment of terrorists. Before we go in detail on this subject, first the reader will be provided with some background information. You can say lot things about Turks. You can say that they do not respect human rights, you can that they are too nationalistic (Ataturk: It is proud to be a Turk), you can say that they neglect the rights of minorities etc.. and list goes on… However, in case of the “Assyrian” GHB/ADO/PKK terrorists the Turks cannot be fooled, because they have here a point, a strong point. O yes, but of course, they will completely and utterly exploit the issue, misuse and exaggerate, they are very good in that. But, one thing is very clear: people like reverend Mete and many others with him do not have a leg to stand on in the matter of spitting at the face of the Turks. This kind of people, really have no slightest idea how they are misusing and ridiculing the name of Christ Jesus. And still, they have no idea why they became refugee at the doors of others and even don’t want to understand the reason behind it. Due to the activities of the PKK/GHB/ADO “Assyrian” terrorists – the ultimate product of the Western immorality in the Middle-East- the Turkish Supreme Court in 2006 added our people in Turkey to their list of terrorist organization, a very serious matter where the backward and lazy people even did not pay attention to it. Our organization however did pay attention to this unfair decision and we published an article on this matter. After the publication of our article, the ADO/PKK/GHB “Assyrian” terrorists started a hate campaign against our organization. They copied and twisted the content of the article and spread among the people in the monastery and in churches, and addressed the people, distorted the content of the article etc.. etc.. And the fool and blind people? They accepted their terrorist lies as a ‘sweat” cake. The ADO/GHB “Assyrian” terrorists contacted their great friend Isa Gultan and bishop Samuel Aktas. After this, Gultan and Aktas contacted some people in Holland and urged for measures against our organization, amongst others they contacted the federation. Our people from Europe who visited the monastery Mor Gabriel were also addressed by Isa Gultan and urged to take action against Aram-Naharaim organization. Mr. Isa Gultan is originally from the village of Bote in Tur Abdin. For that reason, some criminal families from Bote in Holland, Sweden and elsewhere started to murmur and wanted to take action against the Aram-Naharaim organization. That is to say, to silence Aram-Naharaim by using force. These idiotic and criminal bandits cannot read and write, their evilness and hatred was mainly fueled by the lies and propaganda of the GHB/ADO/PKK “Assyrian” terrorists. About the villages around the Cudi mountain we extensively discussed this under paragraph 3.3. Mr. Ocalan is now urging ADO to involve also other parts of Turkey in the struggle of PKK. If we are correct in our assumption, Mr. Numan Ugur from the village of Mezizah, also studied under Isa Gulten in the St. Gabriel monastery. Many people who have studied in the St. Gabriel monastery under leadership of Isa Gulten were very vulnerable to the criminal “Assyrian” ideology and therefore sensitive to the recruitment for GHB/ADO/PKK. In their struggle against PKK, the Turks regularly also captured “Christians”. Through their special investigation techniques they were able to winkle considerable information, not only from Christians but also from Muslims. In this way they discovered that a very ugly “spiritual stench” was emanating from the St. Gabriel monastery, namely that some young people involved with the PKK had enjoyed their study in the monastery under leadership of Isa Gultan. The Turks became furious. Because, in the house of God, you should definitely not expect this things to happen. And so they threatened to shut down the monastery St. Gabriel. The GHB/ADO/PKK “Assyrian” terrorists smelled a rat and bombarded the European politicians with the news that Turkey does not respect the freedom of religion and wants therefore shut down the “Assyrian monastery”. And with that the “Assyrian” terrorists had achieved their goal, namely that the politicians took the word “Assyrians” in their mouth, and that was the ultimate goal of these terrorists. In Holland for example, the PKK/ADO/GHB “Assyrian” terrorists contacted Mr. E. van Middlekoop (former member of GPV: Gereformeerd Politiek verbond), now defense minister, to ask question in the Parliament to the minister of foreign affairs regarding “Assyrian Monastery”. And indeed Mr. van Middelkoop took (in that time: 1998) the word “Assyrian” in his mouth and asked questions to the minister of foreign affairs, Mr. Hans van Mierlo. Our message to this foolish and idiotic people in Holland, Sweden and elsewhere who feel connected with Mr. Isa Gulten, and have attacked our organization severely is this one: Do not attack and blame us, the Turks are not foolish. The Turkish secret service already know for ten years about the activities of Mr. Isa Gulten in the monastery and so do all of you. Thus: stop please with this hypocrisy of worst kind. If you really care about Mr. Gulten, then please go and tell him that he should immediately leave the monastery. The monastery is a place for prayer and obedience to the Lord God. It is certainly not meant to make children inside the monastery. As a human rights organization, we care about our people. That does not mean that we justify the lies and fallacies to attack other nations. We say this, because the "Assyrian" terrorists on many occasions have tried to fool some journalists and politicians by accusing the Aram-Naharaim organization of being "pro-Turkish" or even "led by the Turks". Well, we are certainly not at the hands of the Turks of whomever. We are Christian organization with Christian values and standards. Therefore we cannot tolerate baseless lies and fake accusations. This fallacies unfortunately are the trademark of the "Assyrian" terrorists. Never taking the time to look in the mirror in order to understand their own mistakes, but always ready to make fanfare, hullabaloo to ridicule other nations. This is wrong and evil! So: When the PKK/ADO/GHB “Assyrian” terrorists again come to you with all possible gamuts of lies and falsehoods against the Aram-Naharaim organization, you should realize that these bandits do not care about Mr. Gulten, but care about their personal interests; they do not want the truth to become revealed to the public. These terrorists want to keep the “luxury” of unlimited access to the monasteries. That is all about and nothing else! 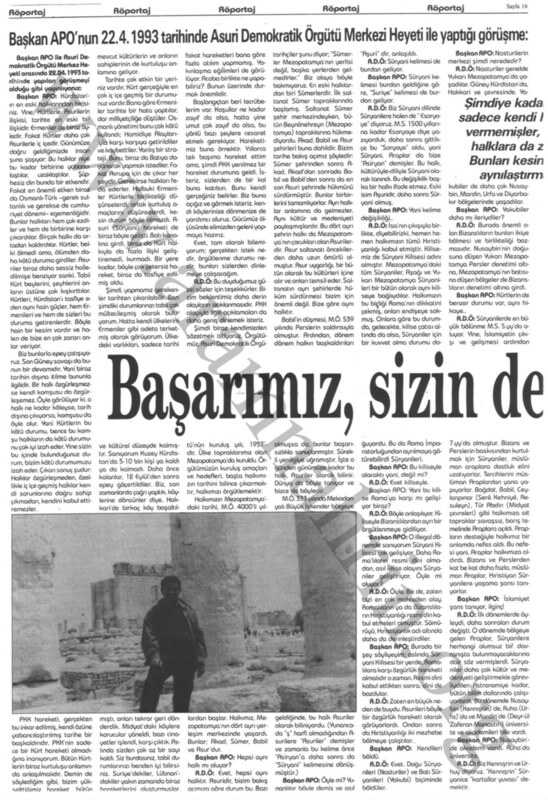 After we provided you with general background information which we felt was important, we present below to you the complete translation of the PKK newspaper Berxwedan of 15 June 1993. 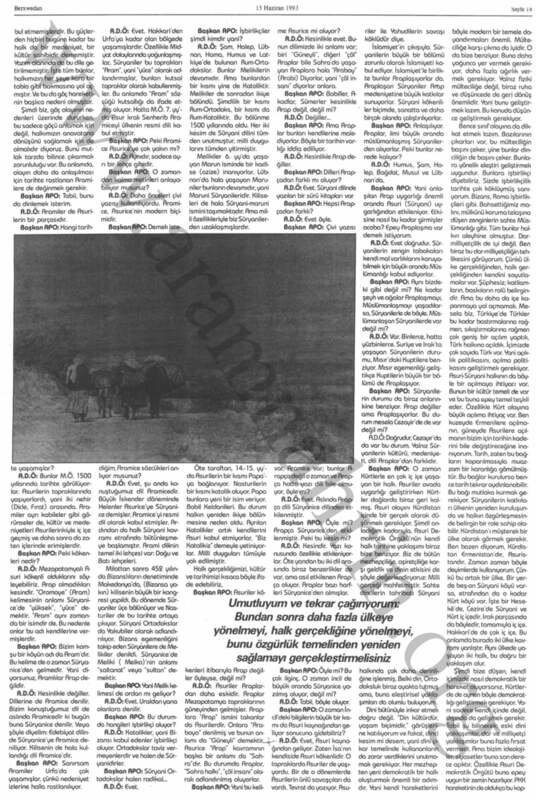 The newspaper Berxwedan was published in Turkey. The language used is not the standard Turkish as spoken in Ankara and Istanbul. The grammar is bad. In spite of the good knowledge of the members of the translation team, yet it was sometimes quite a challenge to translate some parts. Therefore we are infinitely grateful to the team of translators who scarified their time and energy to translate as good as possible the newspaper. The left column is the original Turkish text and right column is the translated text in English. We also have made a high resolution A3-scan of the original newspaper, so that the reader may download to read it or to compare with the typed text of the left couln. Please click on the scan below to download the high-resolution scan of page 16 or to read it online. We report on the meeting took place on 22.4.1993 between Chairman APO and the board of Assyrian Democratic Organization. (Note: APO is nickname for Abdullah Ocalan). Başkan APO: Kurdistan’ın en eski halklarından birisiniz. Chairman APO: You are one of oldest peoples of Kurdistan. Yine, Kürtlere Asurilerin ilişkisi tarihte en eski bir ilişkidir. The cooperation between the Kurds and the Assyrians is again oldest one in the history. This was also a little bit with Armenians. Fakat Kürtler daha çok Asurilerle iç içedir. However the cooperation between the Kurds and the Assyrians was more intense. Günümüze doğru geldiğimizde insan şuna şaşırıyor: Bu halklar niye bu kadar birbirine yabancılaştılar, uzaklaştılar. Until today one gets confused: why did these people became strangers to one another, drifted apart. Şübhesiz din bunda bir etkendir. Undoubtedly, the faith is one of the reasons. Fakat en önemli etken biraz da Osmanlı- Türk- gerek sultanlık ve gerekse de cumhuriyet dönemi- egemenliğidir. However one of the most important reason little bit also the dominating era of the Turkish- Ottoman Empire of Sultanate and/ or the era of republic. Bunlar halkları hem çok ezdiler ve hem de birbirine karşı çıkardılar. They crushed the peoples and set them against each other as well. Birçok halkı da oradan kaldırdılar. Some of these peoples were moved from the place where the lived. Kürtler, belki ölmedi ama, ölümden daha kötü duruma girdiler. Perhaps the Kurds did not die, yet they became in a situation which is worse than the death. Asuriler biraz daha sessiz halledilmişe benziyor sanki. With the Assyrians it seems obviously that it was polished off a bit in quite. Tabii Kürt beylerini, şeyhlerini onların üstüne çok kışkırttılar. Of course, they considerable set the Kurdish leaders, Sheiks against them. Kürtler, Kürdistan’ı tasfiye eden aynı hain gücler, hem Ermenileri ve hem de sizleri bu duruma getirenlerdir. The treacherous rulers who ruled the Kurds and Kurdistan have brought you and Armenians in this thorny situation. Böyle hain bir kesim vardır ve halen de bize en çok zararı onlar verıyor. In that tine we had this kind of traitors and today they are still who caused us severe damage. With this (people) we are completely in combat. Son Güney savaşı da bunun bir devamıdır. The last war in southeastern (of Turkey) is a continuation of that. Yani biraz tarihin dışına itilme bununla ilgilidir. That is to say, this is little bit connected with the fact that these issues in the past have been neglected. Bir halk özgürleşmezse kendi komşusu da özgürleşemez. When a nation does not enjoy freedom, its neighbors will also have no freedom. Öyle görülüyor ki, o halk ne kadar köleyse, tarih dışına çıkıyorsa, komşusu da öyle olur. It seems to be like this, that the extent of subjection of that nation, being neglected by the world, this also became the fate of its neighbors. Yani Kürtlerin bu kötü durumu, bence bu komşu halkların da kötü durumunu çok iyi izah eder. That is to say, the bad situation of the Kurdish people, explains to my opinion also clearly the bad situation of the neighboring peoples. Yine sizin bu içinde bulunduğunuz durum, bizim kötü durumumuzu izah eder. Again, the situation you now find yourself in, explains our bad situation. Çıkan sonuç şudur: Halklar özgürleşmeden, özelikle iç içe geçmiş halklar kendi sorunlarına doğru sahip çıkmadan, kendini kabul ettiremezler. The solution is this: the peoples will only have freedom; in particular the nations living among each others, if they themselves fight for their rights, otherwise the world will also not recognize them. PKK hareketi, gerçekten bu inkar edilmiş, kendi özüne yabancılaştırılmış tarihe bir başkaldırıdır. The PKK movement is really denied, they have sacrificed themselves, and became opponents of history. PKK’nin sadece bir Kürt hareketi olmadığına inanıyorum. I believe that the struggle of PKK is not the struggle of the Kurds only. Bütün Kürtlerin biraz kurtuluşu anlamında anlaşılmalıdır. The intention was little bit the liberation of all Kurds. Demin de söylediğim gibi, bizim yükselttiğimiz hareket bütün mevcut kültürlerin ve onların sahiplerinin de kurtuluşu anlamına geliyor. As I just said before, the increase of the strength of our struggle was meant that the existed cultures and their owners should have had liberated. Tarihte çok etkin bir yeriniz vardır. You have a very important place in the history. Kürt gerçeğiyle en çok iç içe geçmiş bir durumunuz vardır. Your case is very intense interrelated with the Kurdish reality of the past. Bana göre Ermeniler tarihte bir hata yaptılar, dar milliyetçiliğe düstüler. To my opinion, the Armenians made a mistake in the history by relaying on closed nationalism. Osmanlı yönetimi bunu çok kötü kullandı; Hamidiye Alayları’yla karşı karşıya getirildiler ve kaybettiler. The Ottoman Empire misused this very badly by inciting the Hamadiye armies against them and they lost. Bunu, biraz da Batıya dayanarak yapmak istediler. This (partly) also by moving a bit in the direction of Europe. Fakat Avrupa için de çıkar her şeydir. However as for Europe, their interests are above everything. If necessary, they also will sacrifice nations. Halbuki Ermeniler Kürtlerle birlikteliği düşünselerdi, ortak kurtuluş amaçlarını düşünselerdi kesin durumu böyle olmazdı. However, if the Armenians paid attention to unity with the Kurds, would have worked together for common liberation, for sure their situation would not have been like that. Asuri (Suryani) hareketi de biraz böyle geliştir. The struggle of Assyrians (Syrians) resembles a bit to that. They moved in the Western (sphere of) influence, did not paid attention to extra cooperation with the Kurdish nation, did not establish basics. Bir yere kadar, böyle çok yetersiz hareket, biraz da tasfiye edilmiş oldu. To a certain extent, this short-sighted behavior has led to their decline. Şimdi, yapmamız gerekenler tarihten çıkarılabilir. For now, the necessary things which we have to do are that (the bad experiences of the past) easily can be removed (forgotten) from the history. Ben şimdiki durumlarınızı tabii çok mültecileşmiş olarak buluyorum. I feel sorry for your current situation that you became refugee. Hatta kendi ülkelerini Ermeniler gibi adeta terketmiş olarak görüyorum. I see that you have even like the Armenians left your fatherland. Ülkedeki varlıkları, sadece tarihi ve kültürel düzeyde kalmıştır. What is left of them is that their culture and history is still remained there. Sanıyorum Kuzey Kürdistan’da 5-10 bin kişi ya kladı ya da kalmadı. As far as I know there are around 5.000-10.000 persons more or less left in the Eastern Kurdistan. Daha önce kalanlar, 12 Eylül’den sonra epey göçertildiler. An important part of those stayed behind run away after 12th of October. Biz, son zamanlarda çağrı yaptık, köylerine dönsünler diye. Lately we made a call to return back to their villages. Hakkari’de köy boşaltılmıştı, onları tekrar geri dönderdik. In Hakkaria, where the villages were evacuated, we sent them immediately back. Midyat’daki köylere korucular yöneldi, bazı cinayetler işlendi, karşı çıktık. We revolted against the village-defenders, who had entered the villages around Midyat, (and) committed various killings. Aslında sizden çok az bir sayı kaldı. In reality there are but a very few of you left. Sız burdasınız, tabii durumlarınızı benden iyi bilirsiniz. You are living here (Syria), you of course understand your situation much better than I do. Suriye’ dekiler, Lübnan’ dakiler yakın zamandan biraz hareketlerini oluşturmuşlar, fakat hareketleri bana göre fazla atılım yapmamış. Those (Syrians) living in Syria, Lebanon lately have carried our more bit activities, I believe however they did not gain any step further. The movement of rapprochement is also becoming visible. I wonder, what possible we can do together? It is important to think about this. From the beginning I had experience. Koşullar ne kadar zayıf da olsa, hatta yine umut çok zayıf da olsa, bu yönlü bazı şeylere cesaret etmek gerekiyor. No matter how small the requirements might be, even how small the hope might de, we still should not be discouraged. Our movement is an example of this. Yılarca tek başıma hareket ettim ama, şimdi PKK yenilmez bir hareket durumuna geldi. For years I struggled alone, but at this moment the PKK achieved such a level that it is undefeatable. İsteriz, sizlerden de bir kol buna katılsın. We want you also to contribute to this to become a part of it. Biz buna açığız ve görmek isteriz. Kendi köylerinize dönmenize de yardımcı oluruz. Gücümüz ölçüsünde elimizden geleni yapmaya hazırız. Evet, tam olarak bilemyorum, gerçekten istek nedir, örgütlenme durumu nedir, bunları sizlerden dinlemeye çalışacağım. Yes, I don’t know exactly, what is your real requirement, what is the status/ structure of the organization (to be established), this issues I wish to hear from you. (Note translators: With this remark Mr. Ocalan is referring to the sister organsiation of the PKK, namely Gabo’D’Hiruto D’Bethnahrin (GHB), or Bethnahrin Freedom party, established by PKK/ADO after their return from Syria to Germany). A.D.Ö: Bu duyduğumuz güzel sözler için teşekkürler. A.D.O: We wish to thank you for these nice words we heard. Bizim beklentimiz daha derin olayların açıklanmasıdır. We expect that you inform us more about acute matters. PKK olayıyla ilgil açıklamaları da daha geniş dinlemek isteriz. We also wish a comprehensive explanation about matters connected to the PKK. Şimdi biraz kendimizden sözetmek istiyoruz. We want now to tell you something about ourselves. Örgütümüz, Asuri Demokratik Örgütü’ nün kuruluş yılı, 1957’ dir. Our organization, the Assyrian Democratic Organization, is established in 1957. Ülke topraklarımız olan Mezopotamya’ da kuruldu. It was established in our homeland, Mesopotamia. Örgütümüzün kuruluş amaçları ve hedefleri, başta halkımızın tarihini bilince çıkarmaktır, halkımızı örtgütlemektir. The first goal and reason of the establishment of our organization was to make known the history of our people and to unify our people. Halkımızın Mezopotamya’ daki tarihi, M.Ö. 4000’li yılardan başlar. The history of our people starts 4000 BC in Mesopotamia. Halkımız, Mezopotamya’ nın dört ayrı yerleşim merkezinde yaşardı. Our people were living in four different centers in Mesopotamia. Bunlar; Akad, Şümer, Babil ve Asur’dur. These were Akkad, Sumer, Babel and Assur. Başkan APO: Hepsi aynı halk mı oluyor? Chairman APO: They all are one people? A.D.Ö: Evet, hepsi aynı halktır. ADO: Yes, they all are one people. Asuridir, bizim bakış açımıza göre durum bu. Bazı tarihçiler şunu diyor : “ Sümerler, Mezopotamya’ nın yerlisi değil, başka yerlerden gelmediler”. We view this issue in different way. En eski halklardan biri Sümerlerdir, İlk saltanat Sümer topraklarında başlamış. One of the oldest people are Sumerians, the first kingdom was established in the land of Sumeria. Saltanat Sümer şehir merkezindeyken, bütün Beynilnehreyn (Mezopotamya) topraklarına hükmediyordu. From the capital city Sumeria all the area of Beynilnehreyn (Mesopotamia) was ruled. Akad, Babil, ve Asur şehirleri buna dahildir. The cities Akkad, Babel and Assur were excluded from this. Bizim tarihi bakış açımız şöyledir: Sümer şehrinden sonra Babil ve Babil’den sonra da en son Asuri şehrinde hükmünü sürdürmüştür. Our view on the history is as follows: The capital city Sumer was followed by Babel and after Babel finally the power came in the capital city Assur where it was continued. Ayrı halklar anlamına da gelmezler. It does not means they were separated from each other. Aynı kültür ve medeniyeti paylaşmışlardır. They shared the same culture and civilization. Bu dört ayrı şehrin halkı da Mezopotamya’ nın çocukları olan Asurilerdir. The peoples of these different cities of Mesopotamia were the children of Assyrians. Asur saltanatı öncekilerden daha uzun ömürlü olmuştur. The kingdom of Assur lasted longer than its predecessors. Asur uygarlığı, bir bütün olarak bu kültürleri içine alır ve onları temsil eder. The civilization of Assur included all these cultures in itself and represented them. Saltanatın ayrı şehirlerde hüküm sürdürmesi bizim için önemli değil. Exercising the power over the kingdom from different capital cities is not important to us. We believe it is the same people. Babil’in düşmesi, M.Ö. 539 yılında Perslerin saldırısıyla olmuştur. The fall of Babel took place in 539 BC by the attack of Persians. Ardından, dönem dönem halkın başkaldırıları olmuşsa da, bunlar başarısızlıkla sonuçlanmıştır. Although after this, the people revolted from time to time, all this it failed, without victory. İşte o günden günümüze kadar bu halk, Asuriler olarak bilinir. From that moment on until our days this people is considered as Assyrian people. Dünya da böyle tanıyor ve bizce de böyeldir. It is known in the world and we also see like that. M.Ö. 333 yılında Mekadonyalı Büyük İskender bölgeye geldiğinde, bu halk Asuriler olarak biliniyordu. (Yunancada “ş” harfi olmadığından A-surilere “Asuriler” demişler ve zamanla bu kelime önce “Asiryan”a daha sonra da “Süryani” kelimesine dönüşmüştür). When the Macedonian Alexander the Great came to the region in the year 333 BC, he knew this people as Assyrian people. (Because in Greek alphabet, there is no letter “ş” (= Sh), they were called A-syrians “Asyrians” and after a while this became “Asiryan” and than “Syrian”). Chairman APO: Is it like that? Yunanılar böyle demiş ve asıl “Asuri” dir, anlaşıldı. Did the Greek say like that and meaning of this is “Assyrian”? A.D.Ö: Süryani kelimesi de burdan geilyor. A.D.O: The word Syrian also originates form here. Başkan APO: Süryani kelimesi burdan geldiğine göre, “Suriye” kelimesi de burdan geliyor. Chairman APO: Like the word “Syrian” originates from here, also the word “Syria” originates from here. A.D.Ö: Biz Süryani dilinde Süryanilere halen de “Esoryoye” diyoruz. 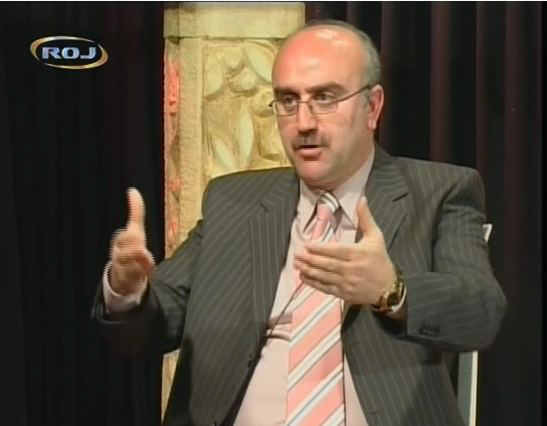 A.D.O: In Syriac language we still call the Syrian people “Esoryoye”. M.S. 1500 yıllarına kadar Esoryoye diye yazıyorduk, daha sonra gettikçe bu “Soryoye” oldu, yani Süryani. Until 1500 AD., we wrote as Esoryoye, after this it became “Soryoye”, that is to say Syrian. Araplar da bize “Asiryan” demişler. De Arabs called as also “Asiryan”. Bu halk, kültürüyle-diliyle Süryani olarak tanındı. This people became culturally and linguistically known as Syrians. Bu değişiklik başka bir halkı ifade etmez. This change does not mean that it a different people. Eski isim Aşurider, daha sonra Süryani olmuş. The old name is Assyrians and later it became Syrians. Başkan APO: Yani kelime değişikliği..
A.D.Ö: İsa’nın çıkışıyla birlikte, diyebilirizki, hemen hem halkımızın tümü Hıristianlığı kabul etmiştir. A.D.O: We know that after the coming of Jesus, our people almost completely together accepted the Christendom. Kilisemiz de Süryani Kilisesi adını almıştır. Our church adapted the name Syrian Church. Mezopotamya’daki tüm Süryaniler, Aşağı ve Yukarı Mezopotamya Süryanileri bir bütün olarak aynı kiliseye bağlıydılar. Those Syrians living Mesopotamia, in Northern and Southern Mesopotamia, al of them belonged to more or less the same church. Halkımızın bu birliği Roma’nın dikkatini çekmiş, onları endişeye sokmuş. The unity within our people attracted the attention of Rome, they started to doubt about them. Onlara göre bu durumda, gelecekte, kilise çatısı altında da olsa, Süryaniler için bir kuvvet olma durumu doğuyordu. According to them, under this condition in the future, even if they stayed under the influence of the church, a situation would become into being for the Syrian that their power would increase. Bu da Roma İmparatorluğundan ayrılmaya götürebilirdi Süryanileri. This could cause the separation of Syrians from the Roman Empire. Başkan APO: Bu kiliseyle olacaktı yani, değil me ? Chairman APO: That is to say, this would take place via the Church, right? A.D.O: Yes, via the church. Başkan APO: Yani bu kilise Roma’ ya karşı mı gelişiyor biraz ? Voorzitter APO: This means that this church is bit an opponent of Rome? A.D.O: It is understood in that way. Kiliseyle Binzanslılardan ayrı bir örgütlenmeye gidiliyor. Via the Church one would have separated from Byzantines and started to unify. Başkan APO: O illegal dönemde sanıyorum Süryani Kilisesi çok gelişiyor. Chairman APO: As I understand, in these difficult times the Syrian Church became very large. Daha Roma’lıların resmi dini olmadan, asıl kilise olayını Şüryaniler geliştiriyor. Before the Church of Rome was officially established, the Syrian Church already was established and was extending. Can we understand like that? Bir de, zaten bizi en çok mahfeden olay, Romalıların ya da Bizanslıların Hıristiyanlığı resmi din kabul etmeleri olmuştur. Firstly, what has caused us the most damage was anyway at the times that Byzantines and Romans officially accepted Christianity. Sömürüyü, Hıristiyanlık adı altında daha da derinleştirdiler. This persecution was worsened under the cover of Christianity. Başkan APO: Burada bir şey söyliyeyim; aslında Süryani Kilisesi bir yerde, Romalılara karşı özğürlük hareketi olmalıdır o zaman. Chairman APO: I want to say something here; in that case actually the Syrian Church should in a way struggle against Rome for liberation. Resmi dini kabul ettikten sonra, dini de bozdular. When they officially adapted the faith, they subsequently damaged it. A.D.Ö: Zaten en büyük neden buydu. A.D.O: Anyhow, this was the biggest cause. Asurileri böyle bir özgürlük hareketi olarak görüyorlardı. The Assyrians didn’t feel the necessity of such liberation movement. Ondan sonra da Hıristiyanlığı mezhebe bölmeye çalıştılar. Thereafter they started to divide the Christianity in denominations. Chairman APO: They have divided. Doğu Süryaniler (Nasturiler) ve Batı Süryaniler (Yakubi) biçiminde böldüler. The East- Syrians (Nestorians) and West- Syrians (Jacobites) were divided among themselves. Başkan APO: Nasturilerin merkezi şimdi nerededir? Chairman APO. : Where is the centre of Nestorians currently? A.D.Ö: Nasturiler genelde Yukarı Mezopotamya’da yaşadılar. ADO: In general the Nestorians lived in Upper- Mesopotamia. Güney Kürdistan’da, Hakkari ve çevresinde. In the north of Kurdistan they were living in Hakkaria and surroundings. Şimdiye kadar bizim hainlerimiz sadece kendi halkına büyük zarar vermemişler, iç içe yaşadığımız halklara da zara vermişlerdir. Bunları kesinlikle Kürt halkıyla aynılaştırmamak gerekiyor. Until now, our traitors not only have caused severe damage to their own nation, but also damaged the people who lived amongst us. This people should certainly in no way be connected with the Kurdish people. Yakubiler de daha çok Nusaybin, Mardin, Urfa ve Diyarbekır bölgelerinde yaşadılar. The majority of Jacobits were living in Nusaybin, Mardin, Urfa and province of Diyarbekir. Başkan APO: Yakubiler daha mı ileriydiler? Chairman APO: Were the Jacobits more cultivated? A.D.Ö: Burada önemli olan Bizansların bunları ikiye bölmesi ve birlikteliği bozmasıdır. ADO: The most important here is that the Byzantines have divided them in twoe parties and damaged their unity. Nusaybin’nin doğusuna düşen Yukarı Mezopotamya Persler denetimi altına, Mezopotamya’nın batısına düşen bölgeler de Bizanslıların denetimi altına girdi. The north of Nusaybin, the Upper- Mesopotamia, came under the dominion of Persians, the provinces situated in the Western Mesopotamia came under the dominion of Byzantines. Başkan APO: Kürtlerin de benzer durumu var, aynı hikaye..
Chairman APO: Also the Kurds have similar situation, the same story. A.D.Ö: Süryanilerde en büyük bölünme M.S. 5.yy’da oluyor. ADO: The biggest division of the Syrian took place in 500 AD. Yine, İslamiyetin çıkışı ve gelişmesi ardından 7.yy’da olmuştur. After the advent and the extend of the Islam around 700, this again took place. Bizans ve Perslerin baskısından kurtulmak için Süryaniler, Müslüman Araplara dostluk elini uzatıyorlar. To be liberated form the persecutions of Byzantines and Persians, the Syrians stretched the hand of peace to the Islamic Arabs. Tercihlerini Müslüman Araplardan yana yapıyorlar. With their choice in favor of Arabic – Islamists, they thought their situation would improve. Bağdad, Babil, Ceylanpınar (Serê Kehniyê, Resuleyın), Tür Abdin (Midyat çevreleri) gibi halkımıza ait topraklar savaşsız, barış temelinde Araplara açıldı. The lands belonged to our people like Bagdad, Babel, Ceylanpınar (Serê Kehniyê, Resuleyın), Tur Abdin (Midyat surroundings) was opened to the Arabs without war and on the basis of peace. Arapların desteğiyle halkımız bir anlamda nefes aldı. With the help of Arabs our people recovered a bit their breath. Bu nefesi yani, Araplar halkımıza aldırdı. That is to say, this recovering of breath was delivered by Arabs to our people. Bizans ve Perslerden kat ve kat daha fazla, Müslüman Araplar, Hıristiyan Süryanilere yaşama şansı tanıyorlar. Much more under the Muslim Arabs than under Persians and Byzantines the Christian Syrians enjoyed (peace and) quite. Başkan APO: İslamiyet şans tanıyor, ilginç. Chairman APO: Does Islam know freedom?, interesting. A.D.Ö: İlk dönemlerde öyleydi, daha sonraları durum değişti. ADO: In the beginning it was like that, later it starts to change. O dönemde bölgeye gelen Araplar, Süryanilere herhangi olumsuz bir davranışta bulunmayacaklarına dair söz vermişlerdi. The Arabs who in that time came to the region promised Syrians that they would harm them in no way. Süryaniler daha çok kültür ve medeniyeti geliştirmekle görevliydiler. The Syrians paid more attention to the expansion of their culture and civilization. Astronomiye kadar, bütün bilim dallarında çalışıyorlardı. They worked on every field of science, to the astronomy. Bu dönemde Nusaybin (Kennışrin)’ de, Ruha (Urfa)’da ve Mardin’de (Deyr-ül Zaferen Manstır) üniversite ve akademileri bile vardı. In those times there were even university and academy in Nusaybin (Kenneshrin), Ruha (Urfa) and Mardin (Deyr Ul Zahfaran monastery). Başkan APO: Nusaybin’de akademi vardı. Chairman APO: There was academy in Nusabin. A.D.Ö: Biz Kennışrın ve Urhuhy diyoruz. ADO: We say Kennishrin and Urhoy. “Kennışrin” Süryanice “kartallar yuvası” demektir. Please click on the scan below to download the high-resolution scan of page 17 or to read it online. Başkan APO: Biz Urfa’ya hala Ruha diyoruz. Sanırsam Süryanice’den gelen bir kelimedir Ruha. I presume that this word Ruha is a Syriac word. A.D.Ö: Bütün bunlarla birlikte, halkımız, katliamlardan kurtulmadı. ADO: Al these issues together did not prevent our people to be slaughtered. Ama, fırsat buldukça da bilimi, medeniyeti, kültürü geliştirmekten de uzak durmuyordu. However when they got opportunity, they continuously increased their knowledge, improved their civilization and culture. Yine bütün bölge halklarıyla barış içinde yaşamayı da sürekli tercih ediyordu. They again preferred always to live with the people in the region on the basis of peace. Her şeyin tersyüz olması 1500’lü yıllarda Osmanlıların güçlenmesiyle başladı. Everything which wrong with them started to happen with the coming of the Ottoman Empire , since the year 1500 (AC). Mevcut çelişkileri daha da derinleştirip halklar arasında kin tohumlarını ekerek, halkları birbirine kırdırdı. The existed differences between peoples were extra reinforced; the seed of hostility was implanted and stirred up with the result that the peoples crushed each others. Avrupalıların bölgeye gelmesi de Osmanlıların istemiydi, çünkü gittikçe en başta kendileri zayıflıyordu. The coming of the Europeans to the region was favored by the Ottoman Empire; because they had became more and more weak. Bazı yeni mezheplerin geliştirilmesi amacıyla Batılı misyonerlere bölgede çalışma izni verildi. To promote the forming of new denominations, the Western missionaries were giving permission to work in the region. O döneme kadar, Yakubi ve Nasturi olmak üzere, Süryanilerin sadece iki mezhebi vardı. Until that time, the Syrians were divided, as usual in two denominations, only as Jacobites and Nestorians. Misyonerlerin, yani Batılı ajan papaz ve rahiplerin bölgeye girmesiyle, katolik ve protestanlık da birer mezhep olarak halkımıza kabul ettirildi. With the coming of the Western missionaries, that is to say the Western secret agents (who worked as) priests and monks, to the region, the Catholicism and Protestantism denominations were diffused within our nation. Tabii ilk geldiklerinde, güya Süryanileri koruyacaklarını iddia etmişlerdi. Of course, when they came for the first time to the region, they supposedly claimed to help the Syrians. Başkan APO: Romalılar ikiye böldü, bunlar da bölünmeyi dörde çıkardı. Chairman APO: The Romans divided them in and they (the missionaries) divided them in four. A.D.Ö: Tabii ki bu bölünmeden Osmanlıların da büyük çıkarı vardı. A.D.O: Of course, the Ottomans had a great profit by this division. Batı’dan hem maddi destek alıyorlar ve hem de Asurilerin bölünmesi Osmanlı egemenliğini rahatlatıyorlar. They got economical support from the West and at the same time the division within the Assyrians provided Ottomans with the quiet. Asuriler (Süryaniler) Osmanlı egemenliği altında yaşıyorlardı. The Assyrians (Syrians) were living under the ruling power of the Ottomans. Onları korumları gerekirken, Batılılara böldürdüler ven sonra da kendilerine yem yaptılar. In stead to protect them, the West divided them and finally they used them for their goals. Halkımız istemediği halde, Avrupalıları zorla yaşadıkları bölgelere sokuyorlardı. In spit of refusal by our people, because of their terrible situation, the Europeans could creep into the region. Tabii bunu da Hıristiyanlık adı altında yapıyorlardı. Of course, they did this under the cover of Christendom. Başkan APO: Niye bunu yapıyorlar? Chairman APO: Why did they do this? A.D.Ö: Osmanlı çıkarları bunu gerektiriyor. A.D.O: The interests of the Ottomans required this. Asurilerin birliği onlar için bir tehlikedir, ama bölünmeleri rahatlatma yaratıyor. The unity of Assyrian was a danger to them, however their division gave them relieve. Eğer halkımız bölünmemiş olsaydı, gerçekten büyük bir güçtü. If our people was not divided, they really would have been a significant power. Osmanlılar için tehlike oluşturuyordu ve zaten bunun için böldüler. The danger within the Ottoman empire started to increase and they would be divided anyway. They achieved their goal by dividing the people. Başkan APO: Yani böl- yönet politikası..
Chairman APO: In other words, divided and rule politics. A.D.Ö: Evet, tüm bunlara ek olarak Arap ve Fars topraklarında da kilise ve medreseler kurmaktan uzak durmadılar. A.D.O: Yes, all these matters promoted continuous foundation of schools and churches in the lands of Arabs and Persians. Aynı şeyleri bu topraklarda da yapmaya çalıştırlar. Exactly the same game they also wanted to play in this country (Syria). Sonuçte Türk, Kürt, Arap ve Farsların egemen güçleri; şeyh ve beyleri, halkımızın katliamında ortak roller oynadılar. At the end the leaders, the Sheiks and rulers of the Turks, the Kurds, the Persians and Arabs have all together played a role in slaughtering of our people. Yine halkımız, tüm acılarını erkenden unutmaya ve elinden geldiğince dostluğu geliştirmeye çalışmıştır. Again our people tried to forget as soon as possible their wounds and have done everything possible to live in friendship (with these nations). Bu halklarla yeniden bazı ilişkileri geliştirmek için Süryaniler, sürekli dostluğu dayatıryordu. To build up again various relations with these nations, the Syrians continuously strived for friendship. 19.yy ve 20.yy’larda Naim Faik, Aşur Yusuf ve Senherib Balê isminde bazı milliyetçi gençlerimiz çıktı. Between the 19th and 20th century few nationalistic youngsters, such as Naim Faik, Aşur Yusuf and Senherib Bale, stood up. “Doğu Yıldızı (Mezopotamya Yıldızı)” adıyla bir de dergi çıkardılar. They published a periodical called “The Star of the East (Star of Mesopotamia)”. Ayrıca “Özgürlük Yolu” adıyla da bir dergi çıkarmaktaydılar. Beside this, they also wanted to publish another periodical with the name “The Path of Liberation”. Bu dergiler üç dilde; Süryanic, Kürtçe ver Türkçe, ama Süryanice alfabeyle yazılıyordu. This periodical were published in 3 languages, Syriac, Turkish and Kurdish, however they were writtin in syriac alphabet. Osmanlılar bunu duyunca, bir halkın tekrar canlandığını ve bu yönlü bir hareketliliğin yaşanmakta olduğunu farkediyor. When the Ottomans became aware of this, they understood that a people anew was waked up and in that way they wanted to establish a movement with a goal. Bu dönemde gerçekten de Ermeni, Kürt ve Süryani hareketleri canlanıyordu. In this time, it was clear that the movement of Armenians, Kurds and Syrians became active. Osmanlılar bir kez daha dini sarıldılar, dine dayalı oyunlara yöneldiler. The Ottomans again resorted to faith through which they gained support. Kürtlerin şeyh ve beylerini yanlarına çekmeyi basardılar. They started to strengthen the ties with the Kurdish Sheiks and rulers. Ermeni ve Süryani katliamlarında bunları kullandılar. They used these leaders to slaughter the Armenians and Syrians. 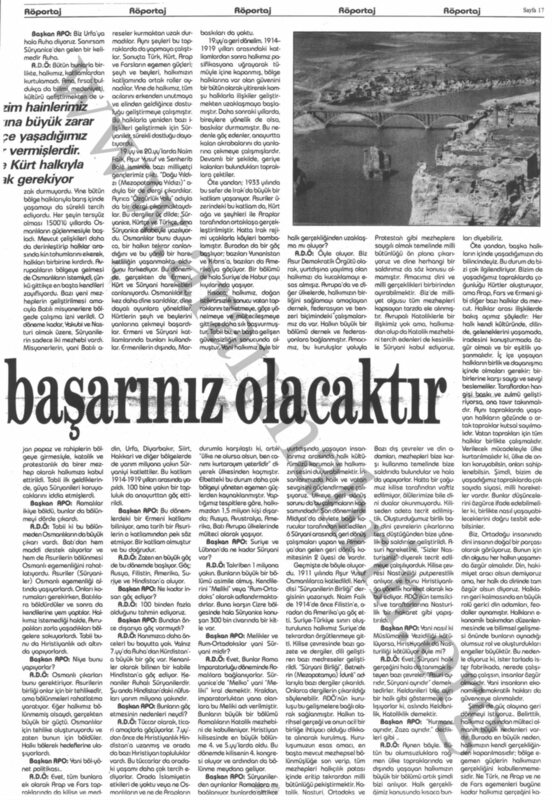 Ermenilerin dışında, Mardin, Urfa, Diyarbekir, Siirt, Hakkari ve diğer bölgelerde de yarım milyona yakın Süryaniyi katlettiler. After Armenians around half million Syrians were slaughtered in Mardin, Urfa, Diyaerbekir, Siirt, Hakkaria and other areas. Bu katliam 1914-1919 yılları arasında yapıldı. The slaughtering took place between 1914 and 1919. 100 bine yakın bir topluluk da anayurttan göç ettirildi. About hundred thousand members of the community became refugee (in abroad). Başkan APO: Bu dönemlerdeki bir Ermeni katliamı biliniyor, ama tarih bir Asurilerin o katliamından pek söz etmiyor. Chairman APO: In those times there is mention of Armenian massacres, but in the history there no mention of Assyrian slaughtering. Bir katliam olmuştur ve bu doğrudur. A slaughtering has been taking place, that is true. A.D.Ö: Zaten en büyük göç de bu dönemde başlıyor. A.D.O: Anyhow, the largest emigration took place in that time. Göç; Rusya, Filistin, Amerika, Suriye ve Hindistan’a oluyor. They fled to Russia, Palestine, America, Syria and India. Başkan APO: Ne kadar insan göc ediyor? Chairman APO: How many people became refugee? A.D.Ö: 100 binden fazla olduğunu tahmin ediyoruz. A.D.O: We estimate more than 100 thousand. Başkan APO: Bundan önce dışarıya göç varmıydı? Chairman APO: Was before this also emigration to abroad? A.D.Ö: Kanımızca daha öncelere bu boyutta yok. A.D.O: We believe, before that event it did not took place in such a magnitude. Yalnız 7.yy’da Ruha’dan Kürdistan’a büyük bir göç var. However, in 7th century there was a huge stream of refugees from Ruha to Kurdistan. Kenaniler büyük olarak bilinen bir kabile Hindistan’a göç eidyor. The Kenanits, a well-known big tribe, emigrated to India. (Note translator: ‘Kenanits’ is not correct description, it should be “Kaynakits. Kaynak is a village in Urfa). These Kenanits were Syrians from Urfa. Şu anda Hindistan’daki nüfüsları yarım milyona yakındır. Currently, there number is estimated around half million in India. Başkan APO: Bunların göç etmesinin nedenleri neydi? Chairman APO: What was the reason behind their emigration? A.D.Ö: Tüccar olarak, ticari amaçlarla göçüyorlar. A.D.O: They were businessmen and they emigrated for business. 7.yy’dan önce de Hıristiyanlık Hindistan’a uzanmış ve orada da bazı Hıristiyan topluluklar vardı. The Christianity already before 7th century reached India and there several Christian groups there. Bu tüccarlar da oradaki yaşamı daha çok tercih ediyorlar. These businessmen could do their business much better there. Orada İslamiyetin etkileri de yoktu veya ne Osmanların ve ne de Arapların baskıları da yoktu. There was neither persecution by Islam, or persecution by the Ottomans nor persecutions by the Arabs. 1914-1919 yılları arasındaki katliamlardan sonra halkımız pasifikasyona uğrayarak tümüyle içine kapanmış, bölge halklarına var olan güvenini bir bütün olarak yitirerek komşu halklara ilişkiler geliştirmekten uzaklaşmaya başlamıştır. After the slaughtering of 1914-1919, our nation became totally in passivity and remained in that situation, they did not trust the peoples of the region, and they started take an aversion to their neighboring nations. Daha sonraki yıllarda, bireylere yönelik de olsa, baskılar durmamıştır. Years after that, although there were trust-undermining acts, the persecution did not stop. Bu nedenle göç edenler, anayurtta kalan akrabalarını da yanlarına çekmeye çalışmışlardır. Because of this reason, those who were emigrated worked to get their family who were left behind in their fatherlands, to the lands of emigration. Devamlı bir şekilde, geriye kalanları bulundukları topraklara çektiler. It continued in this way until al the people who were still there, left the lands behind. Öte yandan; 1933 yılında bu sefer de Irak’da büyük bir katliam yaşanıyor. On the other hand, in 1933 this time a slaughtering was carried out in Iraq. Asuriler üzerindeki bu katliam da, Kürt ağa ve şeyhleri ile Araplar tarafından ortaklaşa gerçekleştirilmiştir. This slaughtering of Assyrians was carried out by the Kurdish Aga’s and Sheiks together with Arabs. Hatta Irak rejimi uçaklarla köyleri bombalamıştır. Even the regime of Iraq bombarded their villages with fighters. Buradan da bir göç başlıyor; bazıları Yunanistan ve Kıbrıs’a bazıları da Amerika’ya göçüyor. From this point emigrated started to take place, some emigrated to Greece and Cyprus, and some to United States. Bir bölümü de hala Suriye’de Habur çayı kıyılarında yaşıyor. A part of this people still lives in Syria and bank of the river the Habur. Kısaca; halkımız doğan istikrarsızlık sonucu vatan topraklarını terketmeye, göçe yönelmeye ve mültecileşmeye gittikçe daha sık başvurmuştur. In short, the result of the beginning of instability was that our people left behind their fatherland, went the path of Diaspora and the emigration is since than extra increased. Tabii bu, en başta gelişen güvensizliğin sonucunda olmuştur. Of course, the main reason for emigration was suspicion. Yani halkımız öyle bir durumla karşılaştı ki, artık “ülke ne olursa olsun, ben canımı kurtarayım yeterlidir” diyerek ülkesinden kaçmıştır. That is to say that our people became in such a severe situation that they said “I do not care about what is going on, I just want to save my skin, that is enough” and escaped their country. Elbetteki bu durum daha çok bölgeyi yöneten egemen güçlerden kaynaklanmıştır. Of course in this situation, those who escaped were the prominent ruling leaders. Yaptığımız tespitlere göre, halkımızdan 1,5 milyon kişi dişarda, Rusya, Avustralya, Amerika, Batı Avrupa ülkelerinde mülteci olarak yaşiyor. According to our investigation, there are 1,5 million of our people living in foreign countries, in Russia, Austria, United States. Başkan APO: Suriye ve Lübnan’da ne kadar Süryani var? Chairman APO: How many Syrians are in Syria and Lebanon? A.D.Ö: Takriben 1 milyona yakın. Bunların büyük bir bölümü asimile olmuş. The major part has been assimilated. Kendilerini “Meliki” veya “Rum- Ortodoks” olrak adlandırmaktadırlar. They present themselves as “Melkits” or as “Rum Orthodox”. Buna karşın Cizre bölgesinde hala Süryanice konuşan 300 bin civarında bir kitle var. As opposed to this, there are in the area of Cizre (Syria) 300.000 who still speak Syriac. Başkan APO: Melikler ve Rum-Ortadokslar yani Süryani midir? Chairman APO: That is to say, are the Melkits and Rum Orthodox Syrians? Bunlar Roma İmparatorluğu döneminde Romalılara bağlanıyorlar. They are since the era of Roman Empire connected with Romans. Süryanice´de “Melko” yani “Meliki” kral demektir. In Syriac, “Malko” means, that is to say “Miliki”, king (emperor). Kraldan, imparatorluktan yana olanlara bu Meliki adı verilmiştir. As from the time of the emperor, the empire, they were given this name. Bunların büyük bir bölümü Romalıların Katolik mezhebini de kabulleniyor. Of this group, a major part, embraces the Roman Catholic denomination. Hıristiyan kilisesinde en büyük bölünme 4. ve 5. yy’larda oldu. In the Christian Church, the major division toot place in the 4th and 5th century. Bu dönemde kilisenin 4. kongresi oluyor ve ardından da bölünme meydana geliyor. In this time four ecclesial congresses were held, and thereafter the division became visible. Başkan APO: Süryanilerden ayrılanlar Romalılara mı bağlanıyor, bunlarda gittikçe halk gerçekliğinden uzaklaşma mı oluyor? Chairman APO: Are those who separated from Syrians and embraced Rome, by their separation got alienated with the true history of their people? A.D.O: Yes, it is like that. Biz Asuri Demokratik Örgütü olarak, yurtdışına yayılmış olan halkımızı da kucaklamayı esas almışız. Avrupa’da ve diğer ülkelerde, halkımızın birliğini sağlamayı amaçlayan dernek, federasyon ve benzeri biçimdeki çalışmalarımız da var. Halkın büyük bir bölümü dernek ve federasyonlara bağlanmıştır. Amacımız, bu kuruluşlar yoluyla yurtdışında yaşayan insanlarımız arasında halk kültürümüzü korumak ve halkımızın sesini duyurabilmektir. Our wish is, through these organizations which reside in foreign countries, to protect our people and culture and to hear the voice of our people with their activities. İnsanlarımızda halk ve vatan sevgisini güçlendirmeye çalışıyoruz. We work to strengthen the love of our people for their nation and land. Ülkeye geri dönüş sorunu da bu çalışmaların kapsamındadır. The issue of return is also connected with this. Son dönemlerde Midyat’da devlete bağlı korucular tarafından katledilen 6 Süryani arasında, geri dönüş çalışmaları yapan ve Almanya’dan gelen geri dönüş komitesinin 2 üyesi de vardır. Lately 6 Syrians were killed in Midyat by village defenders who work for the government, they wanted to return form Germany to Midyat, two of whom were members of the remigration committee. This was also the case in the past. 1911 yılinda Aşur Yusuf Osmanlılarca katledildi. In 1911, Asur Yusuf was killed by the Ottomans. Kendisi “Süryanilerin Birliği” dergisinin yazarıydı. He was the writer of the magazine “Unity of the Syrians”. Naim Faik de 1914’de önce Filistin’e ordan da Amerika’ya göç etti. In 1914 also Naim Faik first escaped to Palatine and thereafter to United Sates. Suriye- Türkiye sınırı oluşturulunca halkımız Suriye’de tekrardan örgütlenmeye gitti. When the (final) border between Syria and Turkey was set down, our people in Syria started again to establish organizations. Kilise çevresinde bazı gazete ve dergiler, dili geliştiren bazı medreseler geliştirildi. In environment of Churches various newspapers and magazines, language promoting schools were established. “Süryani Birliği”, “Betnehrin (Mezopotamya), İdurê” adlarıyla bazı dergiler çıkarıldı. Various magazines were published such as “The Unity of the Syrians”, “Bethnahrin (Mesopotamia), “Idure”. They say that dozens of magazines were published. ADÖ’nün kuruluşu bu gelişmelere bağlı olarak sağlanmıştır. The establishment of ADO is related with the development of these matters. Halkın tarihsel gerçeği ve onun acil bir birliğe ihtiyacı olduğu dikkate alınarak kurulmuş. The reality of the true history of our people required anyway these developments and that is why ADO was established. Kuruluşumuzun esas amacı, en başta mevcut mezhepsel bölünmüşlüğe son verip, tüm mezhepleri halkçılık potası içinde eritip tekrardan milli bütünlüğü pekiştirmektir. The necessity of the establishment of the organization was to make an end to diverse religious denominations, to stop the division and to bring about unity, to melt and bring all of them under one denomination to strengthen their unity as people. Katolik, Nasturi, Ortodoks ve Protestan gibi mezheplere saygılı olmak temelinde milli bütünlüğü ön plana çıkarıyoruz ve dine herhangi bir saldırımız da söz konusu olmamıştır. On the basis of showing respect to all denominations as Catholic, Nestorian, Orthodox and Protestants and considering the unity of the people as most important point, none of these denominations we ever attacked. Amacımız dini ve milli gerçeklikleri birbirinden ayırabilmektir. Our goal is to separate between religion and secular from each other. Biz’de milliyet olgusu tüm mezhepleri kapsayan tarzda ele alınmıstır. We on our part, as a mature nationalists, we have not acted towards these denominations with a bad view. Avruplaı Katolikler bir ilişkimiz yok ama, halkımızdan olup da Katolik mezhebini tercih edenlere de kesinlikle Süryani kabul ediyoruz. We have no relation with Catholics in Europe, however those who belong to the Catholic denomination, for sure we consider them as a part of our nation. Bazı dış çevreler ve din adamları, mezhepleri bize karşı kullanma temelinde bize saldırıda bulundular ve hala da yapıyorlar. In some part of the world, some spiritual leaders have used the denominations against us and attacked us and continue to do so. Hatta bir çoğumuz kilise tarafından vaftiz edilmiyor, ölülerimize bile dini dualar okunmuyordu. Even some of us are not baptized in the church, our deaths are not remembered in during the prayers. Oluşturduğumuz birlik bazı dini çevrelerin çıkarlarına ters düştüğünden bize yönelik bu saldırılar geliştirildi. Because some of the faithful wrongful interpreted our strive to unity, they even attacked us. Asuri hareketine, “Sizler Nasturisiniz” diyerek tecrit edilmeye çalışılıyorduk. About the Assyrian movement they say “you are Nestorians” and worked for to isolate us. Kilise çevresi Nasturiliği putperestlik anlıyor ve bunu Hıristiyanlığa yönelik hareket olarak kabul ediyor. The Church considers Nestorianism as heresy and view it as enmity movement of Christianity. ADÖ´nün temsilcisi ve taraftarlarına Nasturilik bir hakaret gibi yapıştırıldı. A representative of ADO and sympathizers were slandered by linking them to Nestorianism. Başkan APO: Yani nasıl ki Müslümanlık Yezidiliği kötülüyorsa, Hıristiyanlık da Nasturiliği kötülüyor öyle mi? Chairman APO: This means like the Muslims mock the Yezidies, the same way the Christianity mock Nestorianism, right? A.D.Ö: Evet, Süryani halkı gerçeğini hala da tanımak isteyen bazı çevreler, “Asuri ayrıdır, Süryani ayrıdır” demektedirler. ADO: Yes, even now, when want to explain the true history of the Syrian people, in some countries they say “the Syrians are different, the Assyrians are different”. Keldaniler bile ayrı bir halk gibi göstermeye çalışıyorlar ki, aslında Keldanilik, Katoliklik demektir. Even the Chaldeans work for to be considered as a apart people, while in reality the meaning of Chaldean is Catholic. ADO: It is exactly like that. Bütün bu olumsuzluklara rağmen ülke topraklarında ve dışında yaşayan halkımızın büyük bir bölümü artık şimdi bizi anlıyor. In spite of all these problems, the main part of people in the region and outside understands us anyway. Halk gerçekliğimız konusunda kısaca bunları diyebiliriz. In short, these are the matter we can say regarding the truth about our nation. Öte yandan , başka halkların içinde yaşandığımızın da bilincindeyiz. On the other hand, we also should be aware that live among other nations. Bu durum da bizi çok ilgilendiriyor. This issue also greatly occupies attention. Bizim de yaşadığımız topraklarda çoğunluğu Kürtler oluşturuyor, ama Arap, fars ve Ermeni gibi diğer bazı halklar da mevcut. In the countries we live, the majority is Kurds; however there are also other peoples like Arabs, Persians and Armenians. Halklar arası ilişkilerde bakış açımız şöyledir: Her halk kendi kültüründe, dilinde, geleneklerini yaşamada, iradesini konuşturmada özgür olmalı ve bir eşitlik yaşanmalıdır. Our view regarding the relationship between these peoples is as follow: Each people has the right to practice their own culture, language, traditions, right of freedom of expression, and the same rights. İç içe yaşayan halkların birlik ve dayanışma içinde olmaları gerekir; birbirlerine karşı saygı ve sevgi beslemeller. The people who live among each other should be solidary to each other, they should nourish respect and love. Taraflardan hangisi baskı ve zulmü geliştiriyorsa, ona tavır takınmalıdır. Action should be taken against the party which persecute and harms others. Aynı topraklarda yaşayan halkların gözünde o ortak topraklar kutsal sayılmalıdır. The nations living on the same territory should consider the common country as holy. Vatan toprakları için tüm halklar birlikte çalışmalıdır. In the interest of mother country all the peoples should work together. Verilecek mücadeleyle ülke kurtarılmalıdır ki, ülke de onları koruyabilsin, onları sahiplenebilsin. When the country is being liberated by struggle, the inhabitants of that country should help them in order to become heritors. Şimdi, bizim de yaşadığımız topraklarda çok sayıda siyasi, milli hareket ler vardır. We have, at this moment, in the countries where we live numerous political, national movements. Bunlar düşüncelerini özgürce ifade edebilmeliler ki, birlikte nasıl yaşayabileceklerini doğru tesbit ede bilsinler. These movements should express themselves freely, it is important top prove oneself how to live together in worthy way. Biz, Ortadoğu insanınıda dini insanın doğal bir parçası olarak görüyoruz. We consider ourselves as a faithful people which are a part of middle-east. Bunun için din olgusu her halkin yaşamında özgür olmalıdır. For this reason it is important that everybody should practice his faith in freedom. Din, hakimiyet aracı olsun demiyoruz ama, her halk da dininde tam özgür olsun diyoruz. We do not say that faith should rule over people, but each people should be free in experiencing his faith. Halkların geri kalmasında en büyük rolü gerici din adamları, feodaller oynamıştır. The reason that the people are backward has to do with the backwardness of clergy, who acted like liege. Halkların ekonomik bakımdan düzenlenmesinde ve bilimsel gelişmesi önünde bunların oynadığı olumsuz rol ve oluşturdukları engeller büyüktür. The economical situation of the nation should be improved, (however) the by them played negative role and raising up of barriers preventing scientific progress is huge. Bu nedenle diyoruz ki, ister tarlada ister fabrikada, nerede çalışıyarsa çalışsin, insanlar özgür olmalıdır. For this reason we say, regardless where one works, on land or in a factory, the people should be free. Yani insanların ekonomik- demokratik halkları da güvenceye alınmalıdır. That is to say, the economical and democratic rights of people should be protected. Şimdi de güc olayına geri dönmeyi istiyoruz..
Belirttik, halkımız açısından mülteci olmanın büyük nedenleri vardır. We have concluded that the issue of refugee- ship of our people is due to many causes. Burada en büyük neden, halkımızın kendi gerçekliğinden koparılmasıdır; bölge egemen güclerin halkımızın gerçekliğini kabullenmemesidir. The main cause of this is that our people has lost the truth about his origin, the powers of the region did not recognize the truth of our people. Ne Türk, ne Arap ve ne de Fars egemenleri bugüne kadar halkımız gerçeğini kabul etmemişlerdir. Neither the Turks, nor the Arabs, nor the Persians have recognized the real origin of our people. Please click on the scan below to download the high-resolution scan of page 18 or to read it online. Bu güçlerden hiçbiri bugüne kadar bu halk da bir medeniyet, bir kültür sahibidir dememiştir. None of these powers have so far recognized us as a nation with culture and civilization. Yazım alanında da bu dile getirilmemiştir. This problem is so far even not haven made discussable. İşte tüm bunlar, halkımızın her şeye kara bir tablo gibi bakmasına yol açmıştır. All these matters together caused that our people is being considered as a sort of black (undesired) table. Ve bu da göç hareketinin başlıca nedeni olmuştur. And this also is the cause for their Diaspora. Şimdi biz, göç olayının nedenleri üzerinde dururken, bu sadece göçü anlamak için değil, halkımızın anavatana dönüşünü sağlamak için de olmalıdır diyoruz. The previously discussed issue of Diaspora does not mean that we want to learn something about Diaspora, but that our people return to their motherland that is what we want to say. Bunu mutlak tarzda bilince çıkarmak zorunluluğu var. It is difficult to explain this to our people. Bu anlamda, olayın daha da anlaşılması için tarihte rastlanan Aramilere de değinmek gerekir. To explain the matter more accurate in this regard, it is necessary also to give account of the in history known Arameans. Başkan APO: Tabii, bunu da dinlemek isterim. Chairman APO: Of course, I wish also to hear about that. A.D.Ö: Aramiler de Asurilerin bir parçasıdır. A.D.O: The Arameans are also a part of the Assyrians. Başkan APO: Hangi tarihte yaşarmışlar ? Chairman APO: In which era did they live? A.D.Ö: Bunlar M.Ö. 1500 yılarında tarihte görülüyorlar. A.D.O: In the history they appear in the year 1500 BC. Asurilerin topraklarında yaşıyorlardı, yani iki nehir (Dicle, Fırat) arasında. They were living in the area of Assyrians, that is to say, the two rivers (Tigris, Euphrates). Aramiler ayrı kabileler gibi görünseler de, kültür ve medeniyetleri Asurilerinkiyle iç içe geçmiş ve daha sonra da zaten içlerinde erimişlerdir. Even if the Arameans are considered as a separate people, they thoroughly were connected with the Assyrians as regards their culture and civilizations and after that they vanished anyway. Başkan APO: Peki kökenleri nedir ? Chairman APO: Okay, what is their origin? A.D.Ö: Mezopotamyalı Asuri kökenli olduklarını söyleyebiliriz. A.D.O: We can say that they are the descendants of the Assyrians of Mesopotamia. For sure, they are no Arabs. “Oromoye” (Aram) kelimesinin anlamı Süryanice’de “yüksek”, “yüce” demektir. The meaning of the word “Oromoye” (Aram) in Syriac is “Big”, “High”. “Aram” aynı zamanda bir isimdir de. At the same time “Aram” is also a name. Bu nedenle onlar bu adı kendilerine vermişlerdir. For this reason they apply this name to themselves. Başkan APO: Bizim komşu bir köyün adı da Aram’dır. Chairman APO: One of our neighboring village also has a name Aram. Bu kelime de o zaman Süryanice’den gelmedir. In that case this word must also have been originating from Syriac. Yani diyorsunuz, Aramlılar Arap değildir. In other words, you say that the Aramean are not Arabs. A.D.O: Absolutely, they are no Arabs. Their language is also called Aramaic. Bizim konuştuğumuz dil de aslında Aramicedir ki buğün buna Süryanice denilir. Also our language which we now speak is actually Aramaic, yet in our days it is called Syriac. Veya şöyle diyelim: Edebiyat dilinde Süryanice’ye Aramice deniliyor. We can put it like this: in literature Aramaic is also being called Syriac. Kilisenin de hala kulandığı dil Aramice’dir. In the church still Aramaic is used. Başkan APO: Sanırsam Aramiler Urfa’da çok yaşamışlar, çünkü medeniyet izlerine halla rastlaniliyor. Chairman APO: I thought that many Arameans lived in Urfa, for there still traces of civilization can be found. Hakkari’den Urfa´ya kadar olan bölgede yaşamışlardır. They lived in the area of Hakkaria to Urfa. In particular they were concentrated in the environs of Midyat. Süryaniler bu toprakları “Aram”, yani “yüce” olarak adlandırmışlar, bunları kutsal topraklar olarakkabullenmişler. The Syrians have made this land known as “Aram”, that is to say “High”, they accepted it as a holy country. Bu anlamda “Aram” sözcüğü kutsallığı da ifade etmiş oluyor. In this sense, it also becomes clear the holiness of the name Aram. Hatta M.Ö. 7. yy’da Asur kıralı Senherib Aramiceyi ülkenin resmi dili kabul etmiştir. Even in the year 700 BC the Assyrian king Senherib officially adapted the Aramaic language as the language of the region. Başkan APO: Peki Aramice Asurice’ye çok yakın mı? Chairman APO: Is Aramaic much close to Assyrian? A.D.Ö: Aynıdır, sadece ayrı bir lehçe gibidir. A.D.O: It is the same; it is only a dialect of it. Başkan APO: O zamandan kalma metinleri anlayabiliyor musunuz? Chairman APO: Do you understand the survived texts also today? A.D.Ö: Daha önceleri çivi yazısı kullaniliyordu. Aramaic is a modern form of Assyriac. Başkan APO: Demek istediğim, Aramice sözcükleri anlıyor musunuz? Chairman APO: What I want to say is whether you do understand the Aramaic words? A.D.Ö: Evet, şu anda konuştuğumuz dil Aramicedir. A.D.O: Yes, the current language we speak is Aramaic. Büyük İskender döneminde Helenler Asurice’ye Süryanice demişler, Aramice’yi resmi dil olarak kabul etmişler. At the times of Alexander the Great they called Assyriac “Syriac” language, Aramaic was officially recognized. Ardından da halk Süryani kavramı etrafında bütünleşmeye başlamıştır. Hereafter the Syrian people started to implement this concept in the area. Arami dilinin temel iki lehçesi var: Doğü ve Batı lehçeleri. The Aramaic language has two dialects: East- Aramean and West- Aramean. Milattan sonra 452 yılında Bizanslıların dönetiminde Makedonya’da (Bizansa yakın) kilisenin büyük bir kongresi yapıldı. In the year 452 AD, at the times of Byzantines, a meeting was held in Macedonia in the church most allied to the Byzantine church. Bu dönemende Süryaniler üçe bölünüyor ve Nasturiler de bu tarihte ortaya çikıyor. In these times the Syrians got divided into three groups and also in these times the Nestorians emanated. Süryani Ortodokslar da Yakubiler olarak adlandırlıyor. The Syrian Orthodox also became known as Jacobits. Bizans egemenliğini takip eden Süryanilere de Melikiler denildi. The Syrians who followed the Byzantine emperor were called Melkits. Süryanice’de Meliki (Melko) ‘nın anlamı “saltanat” veya “sultan” demektir. The meaning of Meliki (Melko) in Syriac is “principality” or “sultan”. Başkan APO: Yani Melik kelimesi de ordan mı geliyor? Chairman APO: That is to say that the word Melik originates from there? Since the times of Ural, the followers were called so. Başkan APO: Bu durumda hangiler işbirlikçi oluyor? Chairman APO: Whom of them is the collaborator? A.D.Ö: Katolikler, yani Bizansı kabul edenler işbirlikçi oluyor. A.D.O: The Catholics, that is to say those who followed Byzantines are the collaborators. Ortodokslar taviz vermeyenlerdir ve halen de Süryanidirler. The Orthodox did make concessions, until today they are Syrians. Başkan APO: Süryani Ortodokslar halen radikal…. Başkan APO: İşbirlikçiler şimdi kimdir yani? Chairman APO: That is to say, who are the collaborators? A.D.Ö: Şam, Halep, Lübnan, Hama, Humus ve Latikiye´de bulunan Rum-Orthodokslar. A.D.O: The Rum Orthodox who live in Damascus, Aleppo, Lebanon, Hama and Latigya. These are the followers of the Melkits. Ama bunlardan bir kısmı yine Katoliktir. However a part of them again is Catholic. Melikiler de sonradan ikiye bölüdü. After this the Catholics also got divided into two groups. Şimdilik bir kısmı Rum- Ortodoks, bir kısmı da Rum- Katoliktir. At this moment a part of them is Rum Orthodox and the other part is Rum Catholic. Bu bölünme 1500 yıllarında oldu. This division came into being in the year 1500. Her iki kesim de Süryani dilini tümden unutmuştur, milli duygurlanı tümden yitirmiştir. Both groups have completely forgotten the Aramaic language, totally lost awareness of their ethnic origin. Melikiler 6. yy’da yaşayan Marun isminde bir kadise (azize) inanıyorlar. The Melkits believe in the 6th century St. Maron. Lübnan’da hala yaşayan Maruniler bunların devamıdır, yani Maruni Süryanilerdir. The Maronites in Lebanon are their followers, that is to say the Maronite Syrians. Kiliseleri de hala Süryani-Maruni ismini taşımaktadır. Their churches still bear the name Syrian- Maronite. Ama milli özellikleriyle biz Süryanilerden uzaklaşmıslardır. However as regards their ethnic traditions they are drawn apart from the Syrians. Öte taraftan, 14.-15. yy’da Asurilerin bir kısmı Papa‎’ya bağlanıyor. On the other hand a part of the Assyrians accepted in the 14th – 15th century the pope of Rome. Nasturilerin bir kısmı katolik oluyor. A part of the Nestorians becomes Catholic. Papa bunlara yeni bir isim veriyor. The pope gives them a new name. Bu durum halkın yeniden ikiye bölünmesine neden oldu. This situation caused the people again being divided into two (groups). Ayrılan Katolikler artık kendilerini Asuri kabul etmiyorlar, “Biz Katholikiz” demeyle yetiniyorlar. The separated Catholics do not consider themselves as Assyrians, it is sufficient if we “call ourselves Catholics”, they say. Milli duyguları tümüyle yok edilmiştir. Their consciousness of their ethnical origin is completely being put aside. Halk gereçekliğimizi, kültür ve tarihimizi kısaca böyle ifade edebiliriz. In short, the truth about our people, culture and history can be explained in this way. Umutluyum ve tekrar çağırıyorum: Bundan sonra daha fazla ülkeye yönelmeyi, halk gerçekliğine yönelmeyi, bunu özgürlük temelinden yeniden sağlamayı gerçekleştirmelisiniz. I am hopeful and I again repeat: Hereafter we have to help extra the country to progress, to improve the real status, this on the fundament of liberation to blow a new life in it. Başkan APO: Asuriler kökenleri itibarıyla Arap değiller öyleyse, değil mi? Chairman APO: The Assyrians do not descend from Arabs, do they? A.D.Ö: Asuriler Araplardan daha eskidir. A.D.O: The Assyrians are older than Arabs. Araplar Mezopotamya topraklarının güneyinden gelmişler. The Arabs originate from southern Mesopotamia. Araplar “Arap” ismini takanlar da Asurilerdir. Those who gave the name “Arabic” to the Arabs were also Assyrians. Onlara “Araboyo”denilmiş ve bunun anlamı da “Güneyli” demektir. They called them “Arboye” and the meaning of this is “southerners”. Asurica “Arap” kavramının başka bir anlamı da “Sahra” dır. Another meaning of the word “Arabic” in Assyriac is “Sahra”. Bu durumda Araplar, “Sahra halkı”, “çöl insanı” olarak adlandırılmış oluyorlar. In this regards the Arabs are called ”Sahra People”, “desert people”. Başkan APO: Yani bu kelime Asurice mi oluyor? Chairman APO: That is to say, this words originates from Assyriac? Bunu dilimizde iki anlamı var; bir “Güneyli”, diğeri “çöl” Araplar bile Sahra’da yaşayan Araplara hala “Araboy” (Arabi) diyorlar, yani “çöl insanı” diyorlar onlara. This has two meanings in our language, one is called “the Southern” and the other one “desert” Arabs and even the Arabs living in Sahara are still called “Araboye” (Arabs), that is to say “the people of the desert”. Başkan APO: Babiller, Akadlar, Sümerler kesinlikle Arab değil, değil me? Chairman APO: The Babylonians, Akkadians, Sumerians are absolutely not Arabs, right? Başkan APO: Ama Araplar bunları kendilerine mal ediyorler. Chairman APO: But the Arabs appropriate all of them to themselves. Böyle bir tarihin varlığı iddia ediliyor. They claim that such a history exists. A.D.O: They are absolutely no Arabs. Başkan APO: Dilleri Arapçadan farklı mı oluyor? Chairman APO: Is there language different than Arabic? Süryani dilinde yazılan bir sürü kitapları var. Many of their books are written in Syriac. Başkan APO: Hepsi Arapçadan afrklı? Chairman APO: They all differ from Arabic? A.D.O: Yes, that is so. Başkan APO: Çivi yazısı var, Aramice var; bunlar Arapça değil o zaman ve Arapça hatta yazı dili bile olmuyor, öyle mi? Chairman APO: There is cuneiform, there is Aramaic; these are not Arabic, and in those times Arabic did not exist in written form, right? Aslında Arapça dili Süryanice dilinden etkilenmiştir. In reality Arabic originates from Syriac language. Chairman APO: Is that so? The origin of their script is in particular derived from that. Öte yandan bu iki dil arasında biraz benzerlikler de var, ama asıl etkilenen Arapça oluyor. On the other hand the words of these two languages have many similarities, yet in reality Arabic is being derived from. Araplar bazı harfleri Süryanice’den almışlar. The Arabs have derived some of their characters from Syriac. O zaman İncil de büyük oranda Süryanice yazılmış oluyor, değil mi? In that case the Bible is to a great extent also written in Syriac, right? A.D.O: Of course, it sounds like that. Başkan APO: O zaman İncildeki bilgilerin büyük bir kısmı da Asuri kaynağından geliyor sonucuna gidebiliriz? Chairman APO: In that case we eventually can say that a great part of the Bible originate from Assyrian sources? A.D.Ö: Evet, Asuri kaynağından geliyor. A.D.O: Yes, it is from Assyrian sources. Zaten İsa’nın kendiside Asuri kökenlidir. Even Jesus Christ is originally an Assyrian. O topraklarda Asuriler de yaşıyordu. In these countries also Assyrians lived then. Bir de o dönemlerde Asurilerin ünlü savaşçıları da vardı. Firstly, in those times there were also Assyrians who waged wars. Tevrat da yazıyor, Asuriler ile Yahudilerin savaşı köklüdür diye. Also the old testament mentions this, the war between Assyrians and Jews was fierce. İslamiyet’in çıkışıyla Süryanilerin büyük bir bölümü zorunlu olarak İslamiyeti kabul ediyor. After the advent of Islam a major part of the Syrians was forced to Islam. İslamiyet’le birlikte bunlar Araplaşıyorlar da. Along with the Islamisation they also got Arabised. Arablaşan Süryaniler Arap medeniyetine büyük katkılar sunuyorlar. 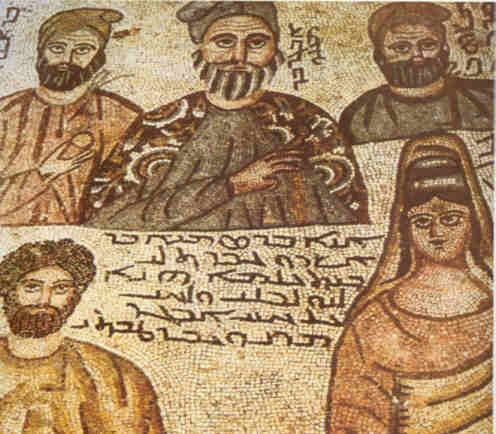 The Arabised Syrians were considered as those who made a considerable contribution to the Arabic civilization. Süryani kökenliler biçimde, sanatta ve daha birçok alanda çalıştırılıyorlar. The typical indigenous Syrian working fields were Arts and various other fields. Araplar, ilmi büyük oranda müsülmanlaşmış Süryanilerden alıyorlar. The Arabs have received their knowledge to a great extent from Syrians. Okay, where do this people live? A.D.Ö: Humus, Şam, Halep, Bağdat, Musul ve Lübnan’da. Başkan APO: Yani anlaşılan Arap uygarlığı önemli oranda Asuri (Süryani) uygarlığından etkileniyor. Chairman APO: In other words, we understand that the Arabic civilization clearly for an important part originates from the Assyrian (Syrian) civilization. Etkine nasıl bu kadar girmişler acaba? One may wonder, how did this influence take place in such a great extent? Epey Arabplaşma var demek istiyorum. I want to say that there exists a great Arabisation. A.D.O: Yes, that is true. Süryanilerin zengin tabakları kendi mal varlıklarını koruyabilmek için büyük oranda Mülsümanlığı kabul ediyorlar. The rich Syrian class accepted for a important part the Islam to protect they money they had. Başkan APO: Aynı bizdeki gibi değil mi? Chairman APO: It is exactly the same happened with us, right? Ne kadar şeyh ve ağalar Araplaşmayı, Müsülmanlaşmayı yaşadılarsa, Süryanilerle de böyle. Likewise it happened with the many arabised, Islamized (Kurdish) Sheiks and Aga’s, in the same way it did happen with the Syrians. Müslümanlaşan Süryanilerde var değil mi? There are also Islamized Syrians, right? By thousands, even by hundred thousands. Suryiye ve Irak’ta taşayan Süryanilerin durumu, Mısır’daki Kuptilere benziyor. The situation of Syrians in Iraq and Syria ic comparable to that of the Copts in Egypt. Mısır egemenliği geliştikçe Kuptiklerin büyük bir bölümü de Arablaşıyor. When the power of Egypt increased, many Copts became Muslims. Başkan APO: Süryanilerin durumu da biraz onlarınkine benziyor. Chairman APO: The situation of Syrians reassembles also to theirs. They are not Arabs, but are being arabised. Bu durum mesela Cezayir’de de var değil me? This situation also exists in Algeria, right? A.D.Ö: Doğrudur, Cezayır’da da var bu durum. A.D.O: That is true, this situation also exists in Algeria. Yalnız Süryanilerin kültürü, medeniyeti, dili Araplar’dan farklıdır. Only the culture, the customs, the language of Syrians differs from that of Arabs. Başkan APO: O zaman Kürtlerle en çok iç içe yaşayan bir halk. In this case, it is the closest nation living among the Kurds. Asuriler ovada uygarlığı geliştirirken Kürtler dağlarda biraz geri kalmış. When the Assyrians extended their civilizations in the steppes, the Kurds remained (underdeveloped) behind in the mountains. Asuri olayını Kürdistan içinde bir gerçek olarak düsünmek gerekiyor. The Assyrian questions should be considered as serious matter within Kurdistan. Şimdi anladığım kadarıyla, Asuri Demokratik Örgütü’nün kendi halk tarihine yaklaşımı biraz bize benziyor. As far as I understood, the situation of the people represented by the Assyrian Democratic Organization resembles little bit with our situation. Biz de bütün mezhepçiliğe, aşiretçiliğe karşi geldik ve dinin etkisini de şöyle değerlendiryoruz: Milli gerçeği mahfestmiştir. We also rebelled against groups, denominations, tribes and (harmful) effects of the faith can be evaluated as follows: The truth about nationality was annihilated. Sahte dincilerin tahribatı Süryani halkında çok daha derinliğine işlenmiş. The damage caused to the Syrian people by the fake clergy is very severe. Belki din, Ortodoksluk biraz ayakta tutmuş ama, buna eleştirisel yaklaşımları da olumlu buluyorum. Perhaps did the Orthodox faith gain more ground, however this should be met with constructive critics. Dini bütünüyle inkar etmek doğru değil. It is not correct to completely deny the faith. “Din kültürdür, yaşam biçimidir,”görüşlerine katılıyorum ve fakat, dinci kesim mi desem, yani dini çıkar temelinde kullananların da zarar verdiklerini unutmamak gerekiyor. “Faith is culture, is a kind of way of life”, I participate in the meetings, yet I cannot say with certainty that they are faithful, that is to say, we should also not forget those who cause damage by taking the fait out of its context and misusing it. Her mezhepten yeni demokratik bir halk oluşturmak önemli bir adımdır. It is necessary to establish within every denomination a democratic movement. Yani kendi hareketlerini böyle modern bir temele dayandırmaları önemli. That is to say that it is important that their acts should be founded on a modern foundation. Mülteciliğe karşi çıkma da iyidir. It is also good to prevent Diaspora. That resembles also to our situation. Buna daha yoğunca yer vermek gerekiyor, daha fazla ağırlık vermek gerekıyor. It is necessary to pay more attention to this, to extra underscore. Yalnız fiziki mülteciliğe değil, ruha düşüncede geri dönüş önemlidir. However, this is not only a physical Diaspora, it is also important to revoke as regards the spiritual well-being. That is to say, it is necessary to improve this. Bu konuda düşünce geliştirmek gerekiyor. In this matter it is well to be more open-minded. Bence sınıf olayına da dikat etmek lazım. To my opinion it is also necessary to pay attention to the issue of denomination. Bazılarının çıkarları var, bu mülteciliğin başını çeker, yine bunlar dinciliğin de başını çeker. Some of them have interests, they are the leaders of Diaspora, and again they are the leading figures of faith. Bunlara yönelik eleşitiri geliştirmek uygundur. A proper critic towards this kind of people is correct. We can say that this people are collaborators. Sizde işbilikçilik tarihte çok köklüymüş sanıyorum. I believe that also within your people in the past treachery was huge. Such as the collaboration with the Byzantines and Romans. Bahsettiğimiz malını, mülkünü koruma telaşınadüşen zenginlerin sahte Müsalmanlığı gibi. Those whom we are talking about who care only about themselves, their home, their money and hearth, resemble to fake Muslims. Tüm bunlar halkın aleyhine olmuştur. All these issues were harmful to the people. Dar- milliyetçilik de iyi değil. Limited kind of nationalism is also wrong. Ben biraz bu dar-milliyetçiliğin tehlikesini görüyorum. I consider limited form of nationalism little bit dangerous. Çünkü ülke gerçekliğinden, halk gerçekliğinden kendini soyutlamalar var. Because there are some who withdraw from the reality of the region, form the reality of the people. Şüphesiz; katliamların, baskınların rolü belirgindir. Doubtlessly, the role of killings and attacks is obvious. Ama bu daha da içe kapanmaya yol açmamalı. However, in spit of all these matters, je should not give up and hide. Mesela biz, Türkiye’ de Türkler bu kadar bastırmalarına rağmen, sıkıştırmalarına rağmen çok geniş bir açılım yaptık, Türk halkına açıldık. For example, in spit we are being persecuted in Turkey, oppressed, we gave a very detailed explanation, informed the Turkish people. İçimizde çok sayıda Türk var. There are with us also many Turks. Yani açıklık politikasını, açılma politikasını geliştirmek gerekiyor. That is to say, the promotion of political explanation, the political revelation. Asuri- Süryani halkının da böyle bir açilmaya ihtiyacı var. The Assyrian- Syrian people need also such a revelation. Bunun bir kültür temeli de var ve bu buna epey temel teşkil eder. This also has a cultural foundation and for this as strong basis required. Özellikle Kürt olayına büyük açılma ihtiyaç var. The Kurdish issue in particular needs such an explanation (from your side). Ben kuzeyde Ermenilere açılmanın, güneyde Asurilere açılmanın bizim için tarihin kaderini bile değistereceğine inanıyorum. I believe that the explanation of Armenians in the south and of the Assyrians in the north, would change (positively) our fate in the history. Tarih, zaten bağların koparılmasıyla muazam bir karanlığa gömülmüştür. Anyhow, the history became in a era of great darkness by the break of the ties. Bu bağlar kurulursa bence tarih tekrar aydınlanabilir. If we repair again these ties, than also again light will shine in the history. Bu bağı mutlaka kurmak gerekiyor. It is necessary to build up this tie. Süryanilerin katkıları ülkenin yeniden kuruluşunda ve halkın özgürleşmesinde belirgin bir role sahip olabilir. Kürdistan’ı müsterek bir ülke olarak görmek gerekir. It is necessary to consider Kurdistan as a common country. Ben bazen diyorum, Kürdistan Ermenistan’ dır, Asuristandır. Sometimes I say, Kurdistan is Armenia, is Assyria. Zaman zaman böyle deyimlerde kullanıyorum. From time to time I repeat these words. Çünkü bu ortak bir ülke. Because this is a common country. Bir yerde beş-on Şüryani köyü varsa, etrafından da o kadar Kürt köyü var. On places where fife- ten Syrian villages can be found, in the environs there are also equally Kurdish villages. İste bir Hesekê’de, Cezire’de Süryani ve Kürt iç içedir. Such as in Heseke, in Cezire the Syrians and Kurds live among each other. Irak parçasında da böyledir, tamamıyla iç içe. This is also the case in the Iraqi part, they completely live among each other. In Hakkaria many live among each other. Bu anlamda burada iki ülke kavramı yanlıştır. In this matter, it is wrong to say that we are dealing with two countries. Aynı ülkede yaşayan iki halk, bu doğru bir yaklaşım olur. In the same area two people live among each other, this is the correct approach. Şimdi bize düşen, kendi içimizde nasıl demokratik bir hareket oluyorsanız, Kürtlerde de aynen böyle demokratlığı geliştirmemk gerekiyor. We are considering (within ourselves) that the way you becomes a democratic movement, it is necessary that the Kurds also in that same way become democratic. Yani sadece kendi içinde değil, dışında da gelişmek gerekir. That is to say, it is not only from within, but also necessary from outside to extend. Tabii şu billinecek; eski dini yaklaşımlar, dar ve milliyetçi yaklaşımlar buna fazla fırsat vermedi. Of course we have to remember that the rapprochement according to the old religions, the limited form of nationalism did not provide extra opportunity to this. Ama bizim ideolojiler, siyasetler buna son derece açıktır. However, our ideologies and politics are in the end transparent. Özellikle Asuri Demokratik Örgütü buna epey uygun bir zemin hazırlıyor. In particular the Assyrian Democratic Organization prepares on this a strong reliable foundation. PKK hareketinin de oldukça bu kapsamda, fakat çok çarpıcı ve büyük gelişen bir hareket olduğunu söyleyebilirim. Also the establishment of PKK movement took place in a such atmosphere; yet I can put it in this way that it has become a very remarkable and huge movement. Please click on the scan below to download the high-resolution scan of page 19 or to read it online. Bazı yurtsever Süryaniler Midyat’ ta bize düşman olan korucular tarafından zarar gördü. Some of the patriotic Syrians living in Midyat have suffered under our enemies, the village defenders. Düşman bazı Süryani köylerine bilinçli olarak yöneldi. The enemy is purposely entered some villages of the Syrians. Fakat şimdi de Süryaniler içimizdedir ve biz bir ayrıcalık görümyoruz. However at this moment the Syrians live among us and we do not see any difference. Talep etkileri, arzuladıkları hemen her şeyi PKK veriyor veya teşkil ediyor. All their requests of concern, wishes immediately is being complied with by the PKK or taken care for. Bence Asuri hareketi de bu cepheleşmenin içinde yer almalıdır. Yakında cephe toplantılarımız gelişir sanıyorum. I believe that soon our meetings will be set up about the front. Çağırdığımızda kendileri de gelebilirler, fakat diğer Kürt örgütelrine daha söylemedim, ama söyleyebilirim. When we make a call, they also can come, but the other Kurdish organizations I have not informed yet, but will tell them. Irak’ta da Asuri harekte Kürt cephesi içindedir sanıyorum. I believe that in Iraq the Assyrian movement is a part of Kurdish front. Surye’ deki Süryaniler daha çok Türkiye’ den gelenlerdir. Dolayısıyla Türkiye Kürdistan’ın daki cepheye katılabilirler. Cezire Kürtleri ve Süryanileri büyük oranda ordan gelmedir; Mardin’den, Midyat’tan ve diğer yerlerden. Great percentage of the Syrians and Kurds living in Cezire come from Mardin, Midyat and other areas. Aynı köyleri, aynı kentleri paylaşıyorlar. They share the same villages and cities. Bundan sonra Avrupa’ da yakınlaşmayı geliştirmek gerekiyor, Cezire’de yakınlaşmayı geliştirmek gerekiyor. After this, it is important that also Europe should be involved, it also necessary to involve Cezire. Birlikte kültür, folklor ve etkinlikler yapılabilir. They jointly may explore the culture, folklore and activities. They jointly may organize demonstrations, mass meetings. Biraz da kadro çalışması yapılabilir. They also little bit can work as a team. Varsa bazı gençler, onları dağa da gönderebiliriz. Zaten Cudi daği etrafındaki köylerden bazı gençler katılıyorlar. Bütün bunlar yeni bir dönem anlamına gelir. All these matters will bring together a new era. Bizim toplantı, böylesine bir dönemin önemli bir başlangıcını teskil edebilir. In this way, our meeting is busy with the beginning of a new important era. Ben Asuri tarihine derin bir ilgi duyuyorum, yine kültürüne, uygarlığına derin bir ilgi duyuyorum. I keep myself intensively busy with the Assyrian history; again I intensively keep myself busy with their culture, civilization. Bunu anladığımız oranda Kürt gerçekliğini de anlayacağımıza eminim. I am confident that to the level we understand this, we also shall understand the Kurdish issue. Yani, Asuri gerçeğini ne kadar açığa çıkarırsak, Kürt gerçeğini de o kadar açıga çıkarırız. That is to say, to the same extent the Assyrian reality will be revealed, also the Kurdish reality will be disclosed. Zor da olsa bu doğru bir yaklaşımdır. Though this is difficult, yet it is the right approach. Tarihte böyle önemli adımlar atmak gerek. It is important in the history to take such important steps. Certainly, it is necessary to re-emigrate. Biz sonuna kadar gereken dayanışmayı gösteririz, kolaylığı sağlarız ve bu işe bizzat mücadelemizi veririz. We shall till to the end demonstrate solidarity, make it essay and in this matter personally struggle. At this moment we are ready for it. Burada mevcut önderlik, yönetim tarihidir sanıyorum. I consider the leaders present here as guiders of history. Bu konuda atılan adımlar da değerlidir. The steps taken in this matter are precious. Bizim hareket bu sahada epey, güç, aldı. Our movement has gained in this arena considerable power. Biz burada devrimci hareketin, mücadelenin geliştirilebileceğine inanıyoruz. We believe here that the revolutionary struggle of the movement will sort result. Suriye bu anlamda, dediğim gibi, Türk faşizminden kaçan halkların bir sığınağı olmuştur. Syria has, as I already told, become a harborage for peoples who escaped because of Turkish fascism. Fakat halklar şimdi gözlerini açmalılar ve geldikleri topraklara tekrar yönelmeliler. However, these peoples should open their eyes and together return to the country where they came from. Ruhta, bilinçte bunu yaratmalılar, başlangıç yapmalılar. Spiritual awareness should serve as start point for the realization of this. Buradaki iktidarla da ilişkiler dostane yürütülür, zaten şimdi bu biraz da gelişmiştir. In this capacity the cooperation should take place in friendship, this is anyway a bit improving. Bu anlamda Arap halkıyla da en iyi ilişkiler geliştiriliyor. In this spirit, we also strengthen this cooperation intensively with the Arabic people. We have once more to evaluate this. Bu sahada benim fazla tecrübem yok tabii. Of course, on this field I do not have much experience. You are more experienced (on this field). Aileleriniz eskiden burada ve burada büyümüşsünüz. Your families are here from way back, and they are grown here (in Syria). Your situation here is much better. Buranın da gerçeklerine dikkate alarak, bizler, biraz daha ileri bir adım atmalıyız diyorum. If we take in consideration the reality here, I believe we have to take a bitbetter steps. In short, we are grateful for such an meeting. I am a happy human being. Genellikle yoktan yaratmayı bildiğim için, bu gelişmeyi de mümkün görüyorum. Because I in general succeeded to create something out of nothing, I consider growth of it possible. Çok kötü durumlardan çok güçlü durumlar ortaya çıkarılabilir. From very bad situations, very strong situations can emerge. Sizler için de böyle düşünebilirim. In the same way I also think about you. Üzerimize düşeni epey yaptık diyorum. I believe that we have done all the necessary for an important from our side. Sizler de denemek ister misiniz? Devrim kervanı yürüyor, bu kervana katılır mısınz? The caravan of revolution is moving forward, are you prepared to participate in this caravan? Bence kesin içinde yer almalısınız diyorum. Asuri- Suryani halkı bu ülkenin aslında bir çiciği olarak görülmeli, her ne kadar ezilmiş ve açılmasına fırsat verilmiyorsa da. Actually we should consider the Assyrian- Syrian people as a flower of this land, which has suffered severely, and did not get the opportunity to flourish. Bizim hareket bunun zeminini, ortamını hazırlıyor; yeniden açılmalı. Our movement prepares the basics, the environment for this, again it will be disclosed. Yine, bir sözüm var onu tekrarlıyayım: Eğer siz almadan da biz zaferi sağlarsak ve Asuriler ülkeye dönmek isterlerse, her zaman hoş gelsinler diyorum. Again I have something to say and want to repeat: If we win the victory without you and the Assyrians want to return to the country, I say that they always are welcome. ADO: Şöylenenler için tekrar teşekkür ediyoruz. A.D.O: We thank you very much for what you have said. Daha önce bellirttiğimiz gibi, komşu halkların egemen sınıflarından çok çektik. As we already have explained, we have severely suffered under some groups of the neighboring people. Şimdiye kadar herhangi bir taraftan veya devletlerden güzel bir şey görmedik. Until now we have not yet from one side or a country seen something good. Şimdiye kadar PKK’nin de bizlere bakış açısı bizler tarafından net bir biçimde billinmiyordu. Until now we were not aware of the unambiguous view of the PKK about our people. Halkımız hakkında yazılı bir görüş ortada görünmüyordu. There was no written view (on the table) about the question of our people. PKK, halkımızın gerçekleğini kabul ettiğini; Türkler, Araplar, Farslar, Kürtler gibi bir halk olduğumuzu yazılı bir biçimde de açıklasa, halkımız buna çok sevinir, cesaret alır ve hatta büyük bir açılım da sağlamış olacak diye düşünüyoruz. The acceptance of the truth about our people by the PKK; as a nation like Turks, Arabs, Persians, Kurds by means of written statement , would be very much appreciated by our people, they would take courage and we even we believe that it would bring about as a great reliable extension of the hand (to our people). Şimdiye kadar Asuri- Süryanilerin Kürtlere de bakış açısı fazla hoş değil, bunu da belirtelim yani. We should also mention that until now the view of the Assyrians- Syrians about the Kurds is not positive one. Asurilere bir halktır gözüyle bakmamışlardı. They did not consider Assyrians as a people. Başkan APO: O Kürtler, Kürt gerçeğini de inkar eden Kürtlerdir. Chairman APO: Those Kurds are Kurd who also deny the Kurdish reality. ADO: PKK’n de bu konuda yetersiz kaldığını düşünüyorduk. A.D.O: We thought that the PKK insufficient was informed about this issue. Başkan APO: PKK’nin sözü budur, size aykırı değildir. Chairman APO: The promise of PKK is this, it is not against you. N.U. tell them about your experiences. (N.U. is abbreviation of Numan Ugur. Ugur was a Christian from Tur Abdin, from the village of Mezizah who was recruited by the PKK in 1984 and was the second man of PKK after Ocalan). N.U. : Şimdi Başkanım, daha önce de arkadaşlarla tarışmıştık bu konuda. N.U. (Numan Uğur): Now my chairman, before I have discussed with the friends about this matter. Bizim de yetmezliğimiz olmuştır, yani Asuri halk gerçekliğini belki yazılı olarak açmadık yeterince. Ama özünde buna da hizmet ettiğimizi vurguladım. However, basically I also stressed that we have paid attention to this. PKK, sadece Kürt ve Süryani halklarının değil, bütün halkların çıkarlarını ve özellikle de bölge halklarının çıkarlarını esas bir harekettir. The PKK belongs not only to the Kurdish or the Syrian people, but is a movement for the interests of all people, and in particular a movement for the fundamental interests of the peoples in the region. Başkan APO: İsa hareketi gibi bir tarz mi desem, yani bir insanlık hareketidir. Chairman APO: If we say that it is a kind of movement like that of Jesus, that is to say a humanist movement. N.U. : Başkanım, bunu arkadaşlara anlattım. N.U. (Numan Uğur): My chairman, this I already told the friends. N.U. : Anlanmadılar değil de, PKK olayını şimdiye kadar tanımıyorlardı. It is not a question of not understanding, until now they were unknown with the issue of the PKK. Başkan APO: Tamamıyla bir insanlık hareketiyiz biz. Chairman APO: In its totality we are a humanist movement. N.U. (Numan Uğur): They do not understand the essence of it. Chairman APO: This is a shortcoming. N.U. (Numan Uğur): It is true, it is a shortcoming. Onların kasdı bir de, madem Asuriler var diyoruz, niye gazetelere yazılmadı. They firstly want to say, if we (= PKK) say that the Assyrians do exist , why did they not write in the newspapers? Başkan APO: Ben kırk defa Asuriler vardir diyorum. The PKK has stated this. N.U. (Numan Uğur): But of course my chairman. They (=PKK) should emphasize, the (=ADO) say, it will be written anyway and it does exist…..
Chairman APO: But of course. Yani şimdi gitsinler Cezire’de söylesinler, ben böyle demişim. That is to say, they should go to Cezire and say that I have said this. Eğer halk kabul etmediyse, tek bir kişi bile kabul etmezse, gelsinler söylemiştir. If the people do not accept this, even if there is one person who do not accept, let them come and say. A.D.O: Let them write, let (the ink) be poured on the writing. Bu söylenenleri, Kürt halkı da, Suryani halkı da bilsin, bu gerçekleri görsün. Let the Kurdish people, let the Syrian people hear what has been told, let them see this reality. Başkan APO: Kendiniz yazmalısnız; dergilerrimiz, gazetlerimiz açik. Chairman APO: You should write, our magazine, newspapers are open (for you). Birey olarak biz de yazacağız. We also will write separate. Bizim istediğimiz PKK’nin veya Parti Önderliğinin bizlere bakış açısı nedir; bu yazılı bir biçimde açıklansın. What we want to know is the view of the PKK or the leaders of the party to our people, let them unfold this in written form. Halkımız bundan çok etkilenir, cesaret alir. Our people would through this be very much influenced, it would take courage. Başkan APO: PKK adına sen yaz N.U. Chairman APO: On behalf of PKK you may write N.U. (= Numan Ugur). Bunu parti kararı haline getir. You should carry out here the decision of the party. Birlikte yazın, biz karar haline getirelim. Write together, we will carry out the decision of the party. Bu konunda sorum yok, o halledilir. This issue is beyond doubt; there will be taken care for it. A.D.Ö: Biz de kendimizi daha da açacağız ve bu anlamda biz, Kürt halkıyla iç içe yaşamaktan sadece mutluluk duyarız. A.D.O: Also we will become more transparent in this regard, the only thing we want is to live in happiness with the Kurdish people. Şu ana kadar Kürt çevrelerden açıklık görmediğimiz için hep kapalı kaldık. Because until now we did not see openness from the Kurdish side, everything remained closed. Başkan APO: Herşey karşılıklı gelişir. Chairman APO: Everything is contradictory. A.D.Ö: Bazı Kürt çevreleri bize yazılarında hep Kürt, Arap, Müsülman veya Hıristian diye hitap ediyorlar: Asuri gerçekliğini gözardı ediyorlar. A.D.O: In some Kurdish environments we are being labeled as Kurds, Arabs, Muslims or Christians: They ignore the authenticity of Assyrians. Başkan APO: O eskidir, bizi etkilemez. Chairman APO: That is old, we are not amenable to that. The history will be rewritten. ADÖ: Eski ilişkiler pek sevindirici, güçlendirici değildi. A.D.O: Old relations were not only joyful, strengthened. Başkan APO: O tarih en az sizin kadar, bizim için de öyle kötüydü. Chairman APO: That bad history for you was at least as bad as for us. A.D.Ö: Bizim dileğimiz şimdiden sonraki dönemde artık olaylar netleşsin, anlaşılsın ve bu halklar birbirini anlasın. A.D.O: Our wish from now on and the coming time is that the events should be clarified, let them understand and let these people understand each other. Bu halklar birbirlerine saygı duymazlarsa birlikte de yaşayamazlar. If these people do not respect each other, they also will not live together. A.D.Ö: Bu halklar birbirine saygı duymazsa, zayıf olan yine ezilir. A.D.O: If these people do not respect each other, the weaker one will be crushed. İsteğimiz şudur: PKK, bizim halk gerçekliğini kabul ettiğini yazılı bir biçimde de ifade etsen. What we want is this: That the PKK the authenticity of our people recognizes in the form of a written statement. Başkan APO: Kabul etmek ne demek? Chairman APO: What does it mean recognizing? There is no such thing as recognizing with us. Until the end we recognize. It is also been published in our publications. Halk olark Asurileri hiçbir zaman inkar etmemişiz. We never denied the Assyrians as a people. Bu yazılarımızda çok yer almıştır. This got plenty of attention in our publications. Numan Uğur (N.U. ): My chairman, I can say this: Until now we, as PKK, did not know ADO well. Karşılıklı ilişkiler gelişmeli ki, biz de birbirimizi doğru tanıyalım. To avoid that the rise of misunderstandings, we should learn each other better. A.D.Ö: Bu açıklamalardan sonra halkımız kesin güven duyacaktır. A.D.O: After this openness, for sure our people will sense more trust. Bizim açımızdan da fazla sorun kalmaz. After our explanation, there will be no problems anymore. Bu temelde de halkların kardeşliği sağlanır. At this moment the brotherhood between (the two) nations is being entrenched. Bu örgüt ve mücadele işidir. This is the task for the organization and the struggle. It will not happen out itself. Ben, düşmanla mücadele ettiğim kadar Kürt gericiliğiyle mücadele ettim. I have struggled with the enemy just as long as with the Kurdish reactionary forces. Benim bu konudaki mücadelem meşhurdur. My struggle in this matter is famous. Halen de Kürtleri hazırlamak için çok büyük bir savaş geliştiriyorum. To prepare the Kurds, now I am waging a great war. Biz tarihte halkların gerceğini inkar eden, onlara birbirine karşı kışkırtan içte ve dişte ne varsa, hepsini silip süpürmeyi hedefleyen bir hareketiz. We are a movement with the aim to mop down everyone die deny the authenticity of the history of the people, who cause hatred within our people in aboard as well as in home, and incite the people against one another. PKK olayını kısaca anlamanız gerekiyor. It is necessary to explain to you in short the issue of the PKK. We are a quite fresh movement. Çoğu bizi peygemberlere benzetiyor, yani “ Bu peygambersel bir çıkıştır “biçiminde değerlendiriyor. The majority compares us with prophets, that is to say, “ this prophecy is being explained” in the form of exodus. Ben Halep’ teki o Süryani Metropolik sayın Yohanna’ nın sözlerine de değer biçiyorum. Bilimyorum onu seviyorlar mı, sevmiyorlarmı; o ayrı. Fakat benim için değerli biri. “Hizmet etmede, barışi sevmede bu böyle“ diyordu. He said, “ Thos who do not serve, do not love peace”. Daha sonra benim için gazetlere manşet attılar ve “ APO kendini İsa’nın yerine koyuyor” diyorlardı. After this they depicted me in newspaper headlines as “APO puts himself in place of Jesus”. Of course because of the fact that the people put a lot of trust in me. Yani bu bile dostluk için ne kadar değerli birşey ifade ettiği açıktır. .
That is to say, even for friendship this is obviously very important matter. İşte bu konuda herhangi bir tereddüt duyulmamalıdır. In this issue there should not be a slightest doubt. Bizim devrim geliştikçe en ufak bir sorun olmaz. If we succeed in our revolution, there will be no slightest problem. Gittikce daha fazla diğer halklar gerçegi de bu işe girecek ve rolünü oynayacaktır. There will be also more and more the authenticity of other people be involved with this issue and will play their role. Yalnız dar- milliyetçilik de tehlikelidir. Only restricted form of nationalism is dangerous. We respect the ethnic reality. Milli kültürü oldukça korumalıyız, geliştirmeliyiz. If there is a ethnical culture, we have to protect this, to promote. Fakat bundan halkların birbirini küçümsemesi ve inkar etmesi gibi bir sonuç çikartılmamalı. However this should not lead to the result that peoples deny and despise each others. Yugoslavya’da, Bosna- Hersek’ – te görüldüğü gibi olmamalı. It should not become like in Yugoslavia, Bosnia – Herzegovina. Birbirini etnik olarak temizleme gibi çok kirli bir duruma asla girilmemeli. It should never become such a dirty situation that people ethnic cleanse each other. Tam tersine halkları, birbirini zenginleştiren gerçekler olarak değerlendirmeliyiz: halklara öyle değer biçmeliyiz. It should exactly be other way around, they should serve as enrichment to each others, value each others authenticity: We should educate the peoples in this way. Iç içe yaşama, karşı karşıya gelmenin değil birleşmenin nedeni olmalıdır. Living among each others does not mean stand against each other, unification in an alliance should take place. PKK bu konunda hazırlıklı bir harekettir. In this regard the PKK is a movement which is ready. En ufak bir milli fark, eşitsizlik gözetmez. Slightest ethnical difference, inequality should not occur. Arkadaşların etkilendiği o geçmiş Kürt milliyetçiliği oluyor, o Kürt beylerinin zorbalıkları oluyor. The former Kurdish nationalist was the oppressor (of our) friends, those who becomes dictator of the Kurdish leaders. Biz sizlerden daha fazla onlara karşıyız. We oppose them more than you do. And we are doing that not with words only, we have realized a great movement against them. In this matter we are very determined. Halkların tarihinde çok kötü rol oynayanların, hain ve işbirlikçilerin tasfiye edilmesi mücadelesinde çok kararlıyız. We are very determined in our struggle against them who played very bad role in the history of the people, and cleaning of traitors and collaborators. Mücadele biraz yaşanırsa, bu görülür. If the struggle arises a bit, it will become visible. Şunu unutmamak gerekir; mücadelede biz başarmadıkça, ne sizin halk gerçeğiniz olur ve ne bizim halk gerceğimiz olur. We should not forget this, if we do not succeed in the struggle, the reality of your people as well as the reality of our people will not be realized. Biz gerçekten halklar gerçeğini mücadeleyle kazanıyoruz. Indeed by means of the struggle we bring about the authenticity of the peoples. Again, I welcome your coming with friendliness, positive and it may result in a new begin. Bundan sonra ilişkileri çeşitli düzeylerde geliştirmeliyiz. After this we should develop the ties on various levels. Please click on the scan below to download the high-resolution scan of page 20 or to read it online. Kesin, her zaman sorunlar olur ama, bizlerin de dayatacağımız çözüm yolları olmalıdır. For sure, there will always remain problems, however we should in turn continue on the path of solution. Bin yıllık sorunları bizim bir çırpıda gidermemiz imkansız. The problems of thousands of years impossible can be solved suddenly. Bin yıllık bu sorunlar ne kadar gerçekçiyse, çözüm yolları da o kadar gerçekçidir. How true these problems of thousands of years might be, the same is true for the path of solution. We have to be idealists, we have to be determined. Karanlık tarihe yenilmeyi kabul etmemeliyiz. We should no accept that the history is being swamped by darkness. Aydınlık dolu bir tarih yaratmak tercihimiz olmalıdır. We should prefer to make history through the plenitude of light. İnanıyorum yani, tarihi geçmişimizde de bunun için yeterli ipuçları da vardır, gerçekler de vardır. I believe that even if we will be mentioned by the history, there are enough reasons for, also facts. A.D.Ö: Tarihte, olumsuzluklar kadar Kürt ve Asuri- Suryani halklarının güzel ilişkileri de vardır. A.D.O: In the history there were besides problems equally also nice relations between Kurds and Assyrians- Syrians. Mezopotamya’nın doğusundaki Asuri- Nasturi aşiretlerinin Kürt aşiretleriyle kirvelik ve benzeri dostana ilişkileri bir gelenek halindeydi. In eastern Mesopotamia there were between the Assyrian- Nestorians and Kurdish clans lovely and comparable friendship relations a common practice. Hakkari’den Cudi’ye, Urmiye’ye, Tür Abdin’e, Diyarbakır’a, Urfa’ya kadar bu illişkiler vardı. As from Hakkaria to Cudi, Urmia, Tur Abdin, Diyarbekir and Urfa, such relations existed. Yani gelenekselleşmiş bir tarzda, Kürtlerle böylesi bağlar kuruluyordo. That is to say, this had became a common practise to build up in this way relations with the Kurds. Yukarı Mezopotamya bugün Kürdistan diye tabir edilen ülke topraklarında. It has became a saying in this region when we say Kurdistan in Upper- Mesopotamia. Bu iki halk günümüze kadar, içten ve diştan dayatılan bütün ihanet ve saldırılara rağmen kardeşçe yaşamayı başarmışlardır. In spite of forcing betrayal and oppression, from inside and outside until our days, this two people should live together brotherly. Bu çok önemli bir husustur, kardeşliği ifade eder. This is a very important issue, the brotherhood gives evidence of this. Bu halkların dini inançları bir olmasa da, ayrlığı ifade etmez. If the faith of these (two) people is not the same, it does not mean the should be separated from each other. 1914-1919 kaliamlarında bütün Kürtler rol oynamadı. Not all Kurds have played a role in the slaughtering of 1914-1919. Hamidiye Alayları ve bazı işbirlikçiler katliamın başını çekiyorlardı. The Hamidiye legion and the many collaborators were the leaders if this slaughtering. Başkan APO: Kesin, o zaman Kürtleri de vuran Kürtler de vardı. Chairman APO: Sure, in that time there were also Kurds fighting against Kurds. A.D.Ö: Yurtsever Kürt aşirelerinin bir kısmı da Süryanileri himaye etmiştir. A.D.O: A part of the patriotic Kurdish tribes protected the Syrians. Yani onları korumaya aldıkları da bir gerçektir. That is to say, protecting them is also a fact. Deyr-ül Zaferan Manastır’nda halen bir Kürt şeyhinin asılı resmi var. Today there is a photo in the Deyr-L Zahfaran monastery of a Kurdish Sheik. Bu şeyhin 1914 yılı katliamı döneminde Süryanilere büyük destek olduğu söyleniyor. This sheik, we are told, has protected the Syrians during the slaughtering of 1914. Tarihte, buna benzer birçok güzel ilişkiye rastlamak mümkündür. Possibly there are in the history more of such comparable nice relations. Kürtler, özgür iradelerine dayalı olarak Süryanilere yönelik herhangi bir katliam geliştirmiş değiller. Driven by the situation of liberation, the goal of the Kurds was in no way to slaughter the Syrians. Tarihte yaşanan katliamların sorumluları bellidir; ya Arap egemen güçleridir, ya Fars egemen güçleridir ya da Osmanlı egemen güçleri ve onların devamı olan TC’dir. The matter of genocide is obvious, whether it were the nationalistic Arab forces, or the nationalistic Persian forces or the Ottoman nationalistic forces and their continuation, the Turkish Republic. Yine sorumlu olan dış güçler vardır; Almanlar, İngilizler gibi. Again, the foreign forces were responsible, such as Germans and English. Süphesis, bazı Kürt ağa, bey şeyhleri de bu diş güçlerin elinde bir alet gibidir. Undoubtedly, the various Kurdish Aga’s and Sheiks were a instrument in the hands of these foreigners. Bunlar hem Süryanilere ve hem de Kürtlere karşı kullanılmışlardır. These were used against Syrians as well as against Kurds. Bunun en bariz örneği Hamidiye Alayları’dır. A abundantly clear example of this were the Hamidiye Legion. Chairman APO: That is clear. Biz o tiplere İdris-i Bitlisiler diyoruz. We call this kind people “mahaleb from Bitlis”. A.D.Ö: Halkımızın aydınları bu gerçekleri biliyor. A.D.O: The illuminated amongst our people know this. Ama halkımızın büyük bir kesimi de bu gerçekleri bilmiyor ve gerçekleri bilmeyenler de, sanki Kürtler gerçek katilleriymiş gibi meseleye bakıryorlar. However a major part of our people do not know these facts, and those not familiar with these facts, consider the matter as if the Kurds actively have killed. Şu anda bizi en çok sevindiren, Kürt öncülerinin, yani önderlik edenlerin şeyh ve beylerin değil, aydın ve ilerici insanların olmasıdır. At this moment, those who love us the most are not the leaders of the Kurds, that is to say, not the executive Sheiks and rulers, but the lovers of light and progress. Kürdistan’daki bütün yurtsever öncülere saygımız olmakla beraber, bize en çok güven ve cesaret verenin PKK öncülüğü olduğunu da vurgulamak istiyoruz. Respecting all the leaders in Kurdistan, at the same time we wish to underscore the leadership of the PKK which gave us a lot of trust courage. PKK Önderliği konusunda bunu açikça ifade ediyoruz. We openly testify (our support) in the matter of leadership of PKK. O eski karanlık tarihin de PKK’nin gücüyle yırtılacağına ve ortadan kaldırılacağına inanıyoruz. We believe that this old dark history by the power of PKK will be crushed and shall disappear from the scene. Yine bu tarihi yükün altından kalkacağına başaracağına da inanıyoruz. We again believe that PKK shall make a begin with removing the (heavy) burden of this (unpleasant) history. PKK öncülüğüyle yaptığımız bu güzel görüşme, bizi gerçekten çok sevindirmiştir, bize büyük cesaret vermiştir. This nice meeting with the leadership of PKK has delighted us, gave us a great courage. Şu gerçeği de ifade edelim. Let we also testify of this truth. Daha önce PKK hakkındaki bilgilerimiz çok yetersizdi. Before this, our knowledge about PKK was very limited. N.U. arkadaşın yanımıza gelmesiyle PKK’yi biraz daha yakından tanımış olduk. After your friend N.U. (= Numan Ugur) came to us, we learned PKK bit more from close by. (Note translators: Here, ADO is referring to the coming of Numan Ugur, the friend of Ocalan, to Germany in 1993. In the Assyrian association “Bethnahrin” in Augsburg one and another was fixed and a delegation on behalf of ADO was sent to Abdullah Ocalan in Syria, under guidance of Numan Ugur). Yani ilişkilerimiz yenidir, birkaç aylıktır. That is to say, our relation is new, since few months. Ama buna rağmen birçok gerçeği öğrenmiş bulunuyoruz. However in spite of this, we learned much regarding the truth. PKK hakkında şu anda güzel bilgiler edinmiş olduk. At this moment we obtained nice information about PKK. Özellikle PKK Önderliği sayın Abdullah Öcalan’la yaptığımız bu görüşmeyle, PKK hakkında daha kapsamlı bir biçimde bilgi sahibi olduk ve biz de bu gerçeklerin altını imzalıyoruz. In particular the meeting we had with the leader of PKK, Mr. Abdullah Ocalan, has expanded our visual range about PKK and we on our turn endorse these truths/facts. Kafamızda bulunan tüm çelişkiler netleşti. All contradictions (about PKK) in our minds are clarified. Bu görüşmenin gelecek için de çok yararlı olacağına inanıyoruz. We believe that this meeting for the future shall be very useful. Öğrendiğimiz bu güzel gerçekleri de ülke içinde ve dışınde yaşayan bütün halkımıza anlatacağız. These beautiful truths/facts which we have learned will be clarified to our people inside (the region) and in abroad. Ülke topraklarına geri dönüş için çalışmalarımızı hızlandıracağız. We shall quicken our activities in relation to the return (of the people) to the countries of the region. PKK gibi ilerici bir gücün de bu konunda destek sunduğunu, Kürt halkının haklarını savunduğu gibi Asuri- Süryani halkının da bütün halklarını savunduğunu ve savunacağını da ileteceğiz. A progressive power as the PKK reaching the hand, such as defending the rights of Kurdish people, in the same way we shall defend all the rights of the Assyrian- Syrian people. We again wish to declare our gratefulness. These were so far the issues we wanted to tell. Başkan APO: Oldu, ben de teşekkür ederim. Chairman APO: Okay, I also thank you. İleride daha kapsamlı görüşmeler olur. In the coming time, bigger meetings will take place. Zaten siz de buradasınız, N.U. arkadaş da buradadır. You are here anyway, friend N.U. (= Numan Ugur) is also here. We shall build up our relations more and more. Ve dediğim gibi, hatta cephe için de size çağırabiliriz. Bu da halkınızı epey meşrulaştırır, Asuri kimliğinin tanınmasını meşrulaştırır, halk hazırlanır. PKK başardıkça herhangi bir sorun da çıkmaz. If PKK conquers, there will be no slightest problem anymore. Dediğim gibi eğer kendileri olmasa da, biz devrimi yaptığımızda, başarıya ulaştığımızda, biz çağrı yapacağiz. As I told, if they are not involved when we have carried out the revolution, we shall make a appeal for the spread of victory. Herkes kendi köyüne gelsin, manastırına sahip çıksın diyeceğiz. We shall say that everybody can return to his villages, take care for his monasteries. This is a substantial part of our movement. Bizde en ufak bir milli ayrıcalık yoktur. We do not make smallest differentiation between ethnicities. Biz sonuna kadar kendine güvenen insanların hareketiyiz. We are until the end a movement of people which believes in itself. Buna sahip çıkmalıyız, yaptığımız hizmet size de hizmettir. We should take responsibility for this, the service provided by us is also your service. Bunu ileride daha iyi anlamak mümkün olacaktır. In the coming time it will be possible to explain this much better. Başarımız, sizin de başarınız olacaktır. Our victory will also be your victory. Başaramak için de çok iddialıyız ve çok büyük bir çabamız vardır. Many ideals and a big efforts are required to achieve victory. Ben de, buraya kadar geldiğiniz için teşekkür ediyorum. From my part, I thank very much for your coming to here. Tekrar görüşeceğimizi de temin ediyorum. I promise that we again will meet each other. A.D.Ö: İnşallah halklarımız için hayırlı bir şeyler yapacağız……..
A.D.O: God willing, we will achieve fruitful things for our people…..
Chairman APO: I am hopeful, I am hopeful. Ve bu vesileyle Asuri- Sürynai halkına da selam de saygılarımı iletmek istiyorum. And by this opportunity, I wish convey my respect and greetings to the Assyrian-Syrian people. Doğrudur; şimdiye kadar bizim hainlerimiz sadece kendi halkına büyük zarar vermişler, iç içe yaşadığımız halklara da zara vermişlerdir. It is true, until now our traitors have caused their people only damage, the peoples living among us they have severely damaged. Bunları kesinlikle Kürt halkıyla aynılaştırmamak gerekiyor. These (people) should certainly not be associated with the Kurdish people. Bunlar, şimdi de, TC’den daha fazla bize zarar veriyorlar. At this moment, these people cause our nation more damage than the Turkish Republic does. Bunlara olan savaşımız, aynı zamanda komşu halklara da verdikleri zararı ortadan kaldıracaktır. Our war is aimed against them and at the same time will the damage they caused to the neighbouring peoples disappear. PKK’yi kesinlikle kendi kardeş örgütleri gibi, kendi varlıklarının da teminatı bir örgüt olark değerlendirebilirler. For certainty can be determined that the PKK likewise its brother organisation is a movement which is faithful to theirs. PKK’ ye bağlı olan tüm Kürt halkı kendi dostlarıdır. The Kurdish people associated with the PKK is trustworthy. Bu yaptığımız toplantı da aynı zamanda onlara bir dostluk çağrısıdır. At the same with this meeting we have geld, we shall also appeal to them for friendship. Bundan sonra her iki halk birbirleriyle ilişkilerini geliştirsinler. From now on, the both peoples should collectively carry out their activities. Let the contacts calmly be build up. Bu başlangıçtaki adımlar ne kadar yavaş da olsa, sonuç parlak olacaktır. Even how slow this beginning steps might be, at the end they shall glorify. Ben kendim de bunu bu vesileyle açıklıyorum. In relation with this, I myself will expose this to publicity. Asuri – Süryani halkı çok önceden de uzanmak istediğimiz bir halktır. The Assyrian- Syrian people are a people which we worked with long time ago. Bu imkanı şimdi biraz daha iyi yakaladığımız için memnunum. I am happy with this possibility which we now a bit more have gained. We also will work for them. Karanlık tarih yerine aydınlık bir tarih elde etmek için, bundan sonraki çalışmalarımız daha da yoğun olacaktır. To switch over from a black history to a history of light, after this our activities should extra be intensified. En az bizim kadar, kendinizi de ülkenin sahibi olarak görmelisiniz. You should at least present yourself as the owners of this region as we do. Bu ülke ortak ülkemizdir, kültür yine ortak kültürümüzdür. This country is our common country, the culture is also our common culture. Umutluyum ve tekrar çagırıyorum: Bundan sonra daha fazla ülkeye yönelmeyi, hal gerçekliğine yönelmeyi, bunu özgürlük temelinde yeniden sağlamayı gerçekleştirmelisiniz. I am hopeful and I repeat again: After this we have extra to help progress the country, to improve the situation, this on a new foundation of liberation carrying out with fresh live. Kendim, şimdiye kadar bütün insanlık için yaptığımız bu mücadeleyi, Süryani halkı gibi tarihte oldukça büyük soykırımla, baskılar yaşamış bir halk için de yapmayı, şeref biliyorum. I myself whom so far have struggled for the whole humanity, consider as honour to fight for a people like the Syrian people, who have suffered in the history a great slaughtering, persecutions. Çabamız, bütün halklar için özgürlük çabasıdır. Our struggle is a struggle for the liberation of all peoples. Bizimle en çok iç içe geçen Süryani halkı için de bir özgürlük çabasıdır. It is a struggle for the Syrian people, the most intensively living together with us. Selam, syagı ve başarı dileklerimi bir kez daha belirtiyorum. I want again convey my peace, respect and liberation greetings.